117 INDUSTRIAL ASSOCIATES LIMITED PARTNERSHIP v. ATLANTIC MICROWAVE CORPORATION, a Delaware Corporation v. EDWARD SALZBERG. Nothing good comes from constructing a building on land one does not yet own, especially when the land is registered. Defendant Atlantic Microwave Corporation, a Delaware Corporation (AMCD) purchased third-party defendant Edward Salzbergs microwave antenna business in 1994. As part of that deal, AMCD reached a separate agreement with the entity that owned the real estate in Bolton on which Salzberg operated the business, plaintiff 117 Industrial Associates Limited Partnership (117 Associates). Under the real estate agreement, 117 Associates would convey to AMCD some of the registered lots it owned (including those on which an existing building sat), and retain the remaining lot. AMCD wanted to expand the existing building onto a portion of the remaining lot, which required the remaining lot to be subdivided. Rather than waiting for the subdivision to be completed, in 1996 AMCD crafted an agreement with 117 Associates whereby it could treat the to-be-carved-out parcel as its own, with subdivision and conveyance to happen in one year. Despite warnings from its own surveyors, AMCD went ahead and expanded the building onto 117 Associates land. Relying on 117 Associates apparent willingness to extend the deadline, however, AMCD never completed the subdivision plan. Instead, after construction it asked 117 Associates to convey even more land than had been agreed to. This was the wrong choice. After construction was completed, relations between AMCD and 117 Associates soured. No subdivision was made. 117 Associates refused to convey any land, and accused AMCD of wrongfully cutting trees on 117 Associates property and engaging in unfair and deceptive acts in trade or commerce. 117 Associates brought its complaint in 2001; AMCD brought counterclaims and third-party claims against Salzberg; the case was tried; this Decision follows. Due to 117 Associates waiver of the deadline for preparing a subdivision plan, AMCD is still entitled to prepare a subdivision plan and obtain title to the portion of the property to which the parties agreed in 1996. It is not, however, entitled to the additional land it sought. AMCD is liable to 117 Associates for damages arising from its continued trespass and use and occupancy of 117 Associates land after its lease expired, from its willful cutting of trees on 117 Associates property, and from its willful and knowing unfair and deceptive acts in agreeing to purchase the rest of 117 Associates property with no actual intention of going through with the agreement, in violation of G.L. c. 93A, §§ 2 and 11. The trespass to trees damages will be trebled and the c. 93A damages doubled, and 117 Associates will submit an application for attorneys fees. 117 Associates filed its five-count Verified Petition Containing Prayers for Injunctive and Declaratory Relief and for Damages (Verified Petition) on April 1, 2001, naming AMCD as defendant. The five counts included: (1) injunctive relief to enjoin the continuing trespass on Parcel 1; (2) trespass claim as to Parcel 2; (3) violation of G.L. c. 242, § 7; (4) violation of G.L. c. 93A; and (5) a nuisance claim. AMCD filed its Answer, Counterclaim, and Third-Party Claim (Answer) on May 1, 2001, naming Salzberg as a third-party defendant. The Answer asserted thirteen affirmative defenses and nine counts, including counterclaims solely against 117 Associates, third-party claims against Salzberg individually, and claims against both 117 Associates and Salzberg. The nine counterclaims and third-party claims are for (1) breach of contract by 117 Associates; (2) breach of implied covenant of good faith and fair dealing by 117 Associates; (3) breach of fiduciary duties by Salzberg; (4) breach of duty of loyalty by Salzberg; (5) intentional misrepresentation by Salzberg and 117 Associates; (6) promissory estoppel against Salzberg and 117 Associates; (7) injunctive relief against 117 Associates; (8) violations of G.L. c. 93A by Salzberg and 117 Associates; and (9) abuse of process against 117 Associates. 117 Associates filed its Answer to Defendants Counterclaim and Answer to Third Party Claim on June 15, 2001. Thereafter, the case sat essentially idle from early 2002 until October 1, 2012, when AMCD filed a Motion to Dismiss for Failure to Prosecute. On November 19, 2012, this court denied the Motion to Dismiss and further instructed the parties to file a separate action in Superior Court, given that certain claims were outside this courts jurisdiction. The parties filed an action in Suffolk County Superior Court, SUCV2012-04411, which was consolidated with the Land Court case in December 2012. I was interdepartmentally assigned as a justice of the Superior Court for the purpose of hearing the Superior Court action. A pre-trial conference was held on December 23, 2013. A view was taken on May 27, 2014, and a five-day trial was held on May 27-28, June 3-4, and June 6, 2014. The court heard testimony from Edward Salzberg, Stanley Dillis, David Cary, Carl Cathcart, David Gaggin, Lawrence Beals, James Eugene Rheault, Christopher Bowler, Robert Billings, and David Lawrence Fuller. Exhibits 1-97 were marked, including excerpts from the depositions of Brian Darcy and Robert Dalton. Atlantic Microwave Corporations Post-Trial Brief along with transcripts of the testimony at trial was filed on August 22, 2014. Plaintiff and Third-Party Defendants Post Trial Brief was filed on August 22, 2014, along with Proposed Findings of Fact. Closing arguments were heard on August 27, 2014. The matter was taken under advisement. This Decision follows. 1. 117 Associates is a Massachusetts limited partnership in good standing in the Commonwealth. Salzberg, a natural person residing at 54 Channel Point Road, Hyannis, Massachusetts, is the general partner of 117 Associates. The limited partners are Robert Dalton (Dalton), Salzbergs wife, Doris, and Daltons wife, Martha. Ex. 1, ¶¶ 1, 2; Ex. 80; Ex. 97, pp. 19-20, 66; Tr. 1:65, 74-75. 2. AMCD is a Delaware corporation with a principal place of business at 10 Cobham Drive, Orchard Park, New York. AMCD is a wholly-owned subsidiary of Cobham Holdings. Cobham Holdings is a subsidiary of a United States-based entity owned by Lochman investments, which is owned by Cobham plc. Ex. 1, ¶¶ 3, 6; Tr. 3:187-88. 3. In 1967, Salzberg and Dalton formed a Massachusetts corporation known as Atlantic Microwave (AMC). AMC provided microwave products, primarily radar products, for ships and airplanes. In the early to mid 1970s, Salzberg acquired approximately thirty-five (35) acres of land in Bolton, Massachusetts, shown on Land Court Plan 33713S as Lots 8, 10, and 56-59. Shortly thereafter, Salzberg and Dalton formed 117 Associates and placed the newly-acquired property in its name. AMC constructed two buildings with footprints of 8,000 square feet on the Bolton property and began to operate its business from this site. Ex. 1, ¶ 4; Ex. 79; Ex. 97, pp. 9-11, 15-18; Tr. 1:71-75, 2:22-23. A copy of Land Court Plan 33713S is attached hereto as Exhibit A. 4. In 1994, Salzberg and Dalton sold AMC to AMCD. In connection with the sale, on November 22, 1994, 117 Associates and AMCD entered into a lease (the Lease) and a Real Property Agreement with respect to the land owned by 117 Associates in Bolton. Both parties were represented by counsel in executing the Lease and Real Property Agreement. Ex. 1, ¶¶ 5, 7, 9; Exs. 2, 3; Ex. 97, p.23; Tr. 1:77-80, 3:247-248. 5. The Lease provided for AMCD to lease from 117 Associates two parcels located in Bolton, Massachusetts, identified as Parcel 1 and Parcel 2 for an initial term running from November 22, 1994 until October 31, 1997. Ex. 1, ¶ 8; Ex. 2; Tr. 1:80. 6. The Lease described Parcels 1 and 2 with reference to attached Exhibits A-1 and A-2 (Lease Exhibits A-1 and A-2, respectively), [Note 1] both of which were reproductions of Land Court Plan 33713S with hand-drawn cross-hatching added on. Parcel 1 is identified on Lease Exhibit A-1 as the cross-hatched area. Lots 8, 10, 57, and 59 are cross-hatched on this exhibit, as well as a portion of Lot 58. Parcel 2 is shown on Exhibit A-2 as all of Lot 58 less the cross-hatched area. [Note 2] Ex. 1, ¶ 8; Ex. 2; Tr. 1:82- 83, 3:194-195, 236. Lease Exhibits A-1 and A-2 are attached hereto as Exhibits B and C, respectively. 7. The Real Property Agreement gave AMCD, in connection with its purchase of AMCs assets, the option to purchase Parcel 1 as described in the Lease between January 1, 1995 and April 30, 1996 for the price of $870,000. If AMCD exercised its purchase option under the Real Property Agreement, it would then have the option to extend the Lease for Parcel 2 until October 31, 1999. Attached to the Terms and Conditions of Sale of the Real Property Agreement was an exhibit identical to Lease Exhibit A-1, showing the cross-hatched Parcel 1 (Exhibit AA). Ex. 1, ¶ 10; Ex. 3, Page 1 & ¶ 1. 8. When the parties entered into the Lease in 1994, AMCD knew that it potentially wanted to expand the Bolton facilities at a later date, for which it would need additional land, and discussed this with Salzberg and Dalton. To facilitate this possibility, the parties included an additional area of land, known as the Additional Acreage, in the Lease and Real Property Agreement. Exs. 2, 3; Ex. 97, p. 53-54, 116; Tr. 1-81; 2:27-28, 69-70; 3:194, 200. 9. 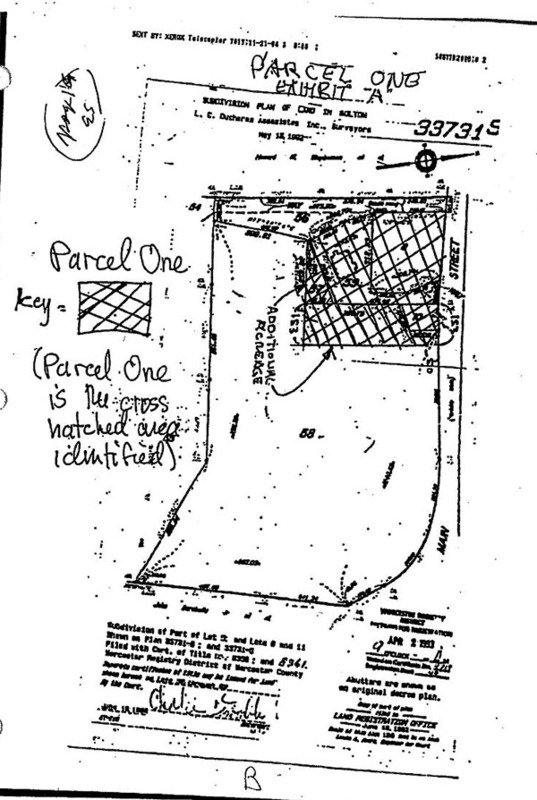 Lease Exhibit A-1 includes the handwritten words Additional Acreage with two arrows pointing to portions of cross-hatched Parcel 1. The upper arrow clearly points to the triangular Lot 57; the lower arrow to a strip of land extending 153 feet into Lot 58 from the southeasterly corner of Parcel 1 (the Strip). At a point 50 feet from the border with Main Street, the lot line of the Strip angles inward and intersects the point where Lot 10 and Main Street meet. Though included in Parcel 1, the Strip is actually a portion of Lot 58. Record ownership of Lot 58 was then and has remained registered to 117 Associates. Ex. 1, ¶ 22; Ex. 2; Tr. 2:140-141. 10. At trial, the size of the Additional Acreage was disputed. Lease Exhibit A- 1 is devoid of acreage calculations. The dispute centers on whether the Additional Acreage originally included Lot 57 and the Strip for a total of approximately 2 acres, or whether the Additional Acreage is approximately 2 acres in addition to Lots 8, 10, 57, and 59. James Rheault (Rheault), a registered Massachusetts professional land surveyor since 1994, testified on behalf of AMCD. He works at Whitman & Bingham Associates, LLC. He opined that the cross-hatched diagrams did not provide enough information for a surveyor to create a plan of land, stating that the diagrams lack dimensions to come up with definitive lot lines. However, he acknowledged on cross-examination that there were some dimensions included on the cross-hatched diagrams and admitted that the problems he identified would not be insurmountable problems for a surveyor. Tr. 4:184-185, 190- 191, 193, 205-207. Stanley Dillis (Dillis), a licensed Massachusetts professional surveyor since 1987, currently with the firm of Ducharme & Dillis, visited the property in October 2013 to update and confirm a survey done by his companys predecessors. He created the plan entitled Existing Conditions Plan Bolton, Massachusetts, dated November 2, 2013 and created by Ducharme & Dillis (the 2013 Ducharme Plan). In doing so, he conducted his own survey, located physical features on the ground, reviewed Land Court records and plans, and the Lease and Real Property Agreement to discern the dimensions of the Additional Acreage. Dillis opined that the triangular Lot 57 is 0.38 acres and the Strip is comprised of 1.6 acres, as reflected in his November 2013 survey. I credit Dilliss testimony as to the approximate dimensions of Lot 57 and the Strip. Ex. 75; Tr. 2:137- 139; 141-142, 163, 169, 171. 11. Based on the documentary evidence in the record and Dilliss testimony, I find that the Additional Acreage, as described in the original Lease and Real Property Agreement included both Lot 57 and the Stripa total of 1.98 acres, i.e. approximately 2 acres. The Real Property Agreement describes the property subject to the option as Parcel 1 as defined in the Lease; the Lease clearly references Parcel One as described in Exhibit A-1 attached hereto. Exhibit A-1 contains arrows explicitly pointing to the Strip and Lot 57 next to the words Additional Acreage. Moreover, an additional diagram on page 6 of the Real Property Agreement depicts the Additional Acreage separate from Parcels 1 and 2 and shows hatch marks on both Lot 57 and the Strip. Further, both parties had the aid of counsel in executing the documents. Ex. 2, p. 19; Ex. 3, pp. 6, 19; Tr. 4:49. A copy of the 2013 Ducharme Plan, marked to show the Strip, is attached hereto as Exhibit D.
12. In 1995, AMCD retained engineers and design professionals to develop plans to construct an extension to the existing Bolton facility. This team included the firm of Bay State Design Associates, Inc. (Bay State). Ex. 1, ¶ 11; Exs. 5, 6, 10; Ex. 33, p. 2. 13. In early 1995, Salzberg attended two meetings at which the proposed new building was discussed among representatives from Bay State and AMCD, among others. The initial plans proposed an addition which would connect the two existing buildings at the Bolton facility. At a February 24, 1995 meeting, Salzberg expressed concern with this proposed layout and suggested adding an addition onto the two-story building instead. Salzberg did not recall attending any other meetings relating to discussion of proposed construction plans. Ex. 5, pp. 1, 4, & attached sketches; Tr. 1:93-97. 14. At the time Salzberg attended the meetings, AMCD still leased Parcels 1 and 2; it had not yet exercised its option to purchase Parcel 1. Exs. 2, 3, 5. 15. On September 21, 1995, AMCD submitted to the Bolton Board of Selectmen a site plan identified as SPA-1, originally dated June 22, 1995 with a rev. 3 date of September 21, 1995 prepared by John G. Crowe Associates, Inc. and Bay State (the Crowe Plan). Ex. 1, ¶ 12; Exs. 10, 11. 16. The Crowe Plan depicted a Proposed Building Addition, which extended from the existing two-story building into an area identified as Lot A. Lot A, shown as 5.90 Ac. (+/-),overlapped with and was larger than the Additional Acreage and had a different configuration. Lot A included portions of what had been shown as Parcel 2 on Lease Exhibit A-1, i.e., portions of Lot 58 that were outside the Strip. The Crowe Plan also depicts a Proposed Tower on the Parcel 2 area, an Area to Be Cleared, and an Area of 20+ High Tree Removal. AMCD planned to build a tower on Parcel 2 for long-range antenna testing, which would transmit to another tower they planned to build in Harvard, Massachusetts. Ex. 10; Ex. 31, p.1 & Sketch D; Tr. 5:187-188. Edward Salzberg et al, Partners 117 Industrial Associates is fully aware of site Plan #SPA-1 dated June 22, 1995 Rev. 3 [the Crowe Plan] and development submitted by Bay State Design for the expansion of Atlantic Microwave. We have agreed to sell and/or lease the property to Atlantic Microwave when the site plan has been approved. Ex. 12; Ex. 96, p. 14; Tr. 1:102-103. 18. The Bolton Board of Selectmen approved rev. 3 of the Crowe Plan on October 12, 1995. The approval included a requirement that no trees over 20 feet be removed until a specific plan for a transmitting tower was approved. AMCD never obtained approval to build a tower in Harvard, and the original plan was scrapped. The approval did, however, permit short-range antenna testing between a proposed tower and the proposed building addition. Ex. 1, ¶ 13, Ex. 13; Tr. 5:187-188. 19. On December 6, 1995, AMCD provided notice to 117 Associates that it was exercising its option under the Real Property Agreement to purchase Parcel 1. The notice letter included reference to an area of approximately 2 acres shown as part of the cross-hatched area on Exhibit A attached to the Terms and Conditions of Sale, which itself is attached to the Real Property Agreement and which I have previously referenced as Exhibit AA. See Ex. 1, ¶¶ 15, 16; Ex. 15. 20. Following AMCDs exercise of its option to buy Parcel 1, counsel for AMCD and 117 Associates began negotiations. One issue discussed was the Strip portion of the Additional Acreage. The Strip could not be transferred immediately because it needed to be further subdivided out of Lot 58, title to which remained registered with 117 Associates. Exs. 17, 18, 20, 21. 21. On January 16, 1996, 117 Associates conveyed Lots 8, 10, and 59 to AMCD. 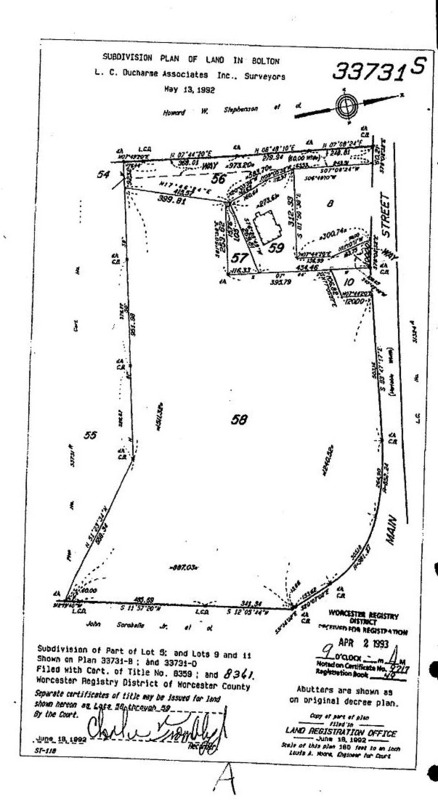 Title to Lot 57, which was part of the crosshatched area in the Additional Acreage shown on Real Property Agreement Exhibit AA, was also included in the 1996 transfer. Also on January 16, 1996, 117 Associates and AMCD entered into a written agreement which provided for the transfer of the remaining portion of Parcel 1 to AMCD (the 1996 Agreement). Ex. 1, ¶¶ 19, 20; Ex. 22. [T]hat portion of Lot 58 shown on Plan 33731S . . . containing approximately two (2) acres of land and shown as cross-hatched on Exhibit A to the Real Property Agreement (said approximately two (2) acre parcel hereinafter referred to as the Additional Acreage). The Additional Acreage under the original Lease and Real Property Agreement included Lot 57 and the Strip, which totaled approximately 2 acres. In the Lease, the cover sheet (page 17) for Exhibit A-1 describes it as: Description of Parcel One consisting of two buildings and approximately two acres of land. The cover sheet for Exhibit AA in the Real Property Agreement insert[s] description of Parcel A-1 from Lease and employs the same description. The references to approximately two acres in the 1994 Lease and Real Property Agreement were in reference to the Additional Acreage when it included both Lot 57 and the Strip. I find that the parties, in describing the land remaining to be conveyed, lifted the terminology and acreage description from the earlier documents. However, once Lot 57 was simultaneously conveyed to AMCD on January 16, 1996, the remaining Additional Acreage to be conveyed consisted only of the 1.6 acre Strip. Exs. 2, 3, 22. 23. Though described as the Additional Acreage, I find that the portion of Lot 58 shown on Plan 33731S . . . shown as cross-hatched on Exhibit A to the Real Property Agreement remaining to be conveyed under the 1996 Agreement, was, in fact, the 1.6 acre Strip. The parties attached a copy of Exhibit AA to the 1996 Agreement. Ex. 22. The Buyer [AMCD] shall use reasonable efforts to cause the completion and approval of the new subdivision plan depicting the Additional Acreage [Strip] and a new deed of such [Strip] (the Additional Deed) within twelve (12) months of the date hereof. . . . Buyer shall request Seller [117 Associates] to convey the [Strip] to Buyer within twelve (12) months of the date hereof, and unless the time for the conveyance of the [Strip] is otherwise extended by the parties, Sellers obligation to convey the [Strip] to Buyer shall terminate on the expiration of such twelve (12) months. 25. AMCD did not prepare a subdivision plan of the Strip, let alone have it approved by the Bolton Planning Board and the Land Court, within one year of the 1996 Agreement. Ex. 1, ¶ 21; Ex. 33, p. 2, ¶ 2; Tr. 3:211-312. 26. 117 Associates is the record owner of Lot 58, consisting of all of Parcel 2 and that portion of Parcel 1 shown as a cross-hatched area of Additional Acreage (i.e. the Strip) which was not conveyed to AMCD. All such land is registered land. Ex. 1, ¶ 22. 27. When AMCD purchased AMC in late 1994, Salzberg entered into a three- year Employment and Consulting Agreement to work for AMCD, first as General Manager and then later as a consultant. [Note 4] Its purpose was to allow for a transition period so that AMCD could bring in new people to take over management responsibilities from Salzberg and eventually replace him. See Ex. 4; Tr. 1:84-85, 3:190- 191, 231-236. 28. David Gaggin (Gaggin), CEO of Chelton Communication Systems (a Cobham Subsidiary) and then-President of AMCD, was responsible for the hiring process. He testified: My job was to buy companies, bring in management teams, put them in place and then to go on and buy other companies. Gaggin hired, among others, Brian Darcy and later David Fuller (Fuller) to run the financial side of AMCD and Robert Ricci (Ricci) to eventually become General Manager and President of AMCD. Tr. 3:189-191, 231-236, 5:150-152. 29. Salzberg was originally placed on the Board of Directors, but quit after one meeting. By 1996, Salzberg was neither an officer nor a director of AMCD, nor was he one at any time thereafter. [Note 5] Ex. 82; Tr. 1:92-93, 2:78, 3:191, 5:154-157. 30. In late 1995 and early 1996, Gaggin and Salzberg corresponded regarding Salzbergs role and responsibilities at AMCD. Salzberg wanted out of the day-to-day operations of the company. In a January 9, 1996 letter, Salzberg wrote: I am still running the company in every meaningful way. . . . Dave, my life is no easier than it was when I owned the company. Ex. 14, p. 1; Ex. 16; Ex. 19, p. 2; Tr. 3:192-194, 231-232. 31. By approximately late 1996 or early 1997, Ricci was acting as general manager and eventually replaced Gaggin as President. When Salzbergs three-year contract expired in late 1997, he agreed to stay on as a consultant. Salzberg was living in Hyannis by this point and spent less time at AMCD. He felt he wasnt needed and was driving a long way. The consultant relationship was short-lived, ending by early 1998. Salzberg was not involved in AMCD management at all in June or July 1998. Ex. 4; Tr. 1:84-85, 2:80-81, 3:189-190, 233-34, 4:7, 5:150-153. 32. AMCD did not proceed with construction of any addition to the building between 1995 and the end of 1997. On December 9, 1997, AMCD inquired of the Bolton Board of Selectmen whether the 1995 approval of its proposed project was still valid. The Selectman confirmed that the approval remained valid. Ex. 1, ¶¶ 14, 23; Exs. 23, 25; Tr. 3:215, 5:158. 33. During 1998, AMCD held meetings with its architects, engineers, and contractors to plan construction of an addition to the AMCD facility. Bay State was again involved in the construction planning process, along with Whitman and Bingham Associates, Inc. (W&B), a surveying and engineering firm. Salzberg did not attend these meetings. Ex. 1, ¶ 24; Exs. 27, 28, 30, 31, 33, 34; Tr. 1:106-07, 5:118, 163-164. 34. 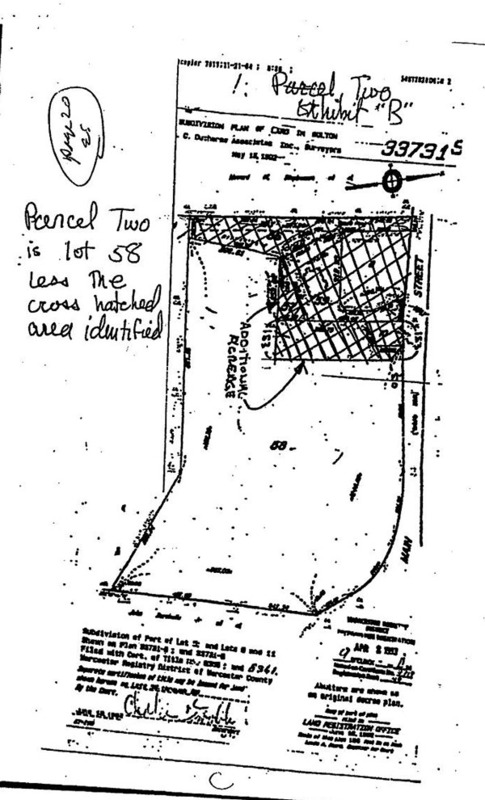 At a May 27, 1998 construction meeting, W&B surveyors informed AMCD of a setback issue with the proposed addition [Note 6] and also that Land Court records did not contain a plan subdividing Lot 58, which was still owned by 117 Associates, into a lot comprising Lot A as shown on the Crowe Plan and a lot comprising the remainder of Lot 58. This was a problem because it meant that the land on which AMCD had obtained approval from the Town to build its addition did not exist as a separate lot. On May 29, 1998, Bay State proposed several options to AMCD to rectify these issues. One option was to obtain an agreement between AMCD and Salzberg agreeing on the [Crowe Plan] property lines and promising to have survey work completed. An attorney should be involved in this. The memo suggested AMCD might be able to get a building permit if both AMCD and Salzberg signed the permit application. Ex. 27, p. 2; Ex. 28. 35. On June 3, 1998, AMCD and its construction consultants discussed among themselves the need for a legally binding agreement with Ed Salzberg to obtain control of 117 Associates land and to obtain a building permit for AMCDs planned construction. This included sorting out the lot line and Land Court issues while the building was under construction. They also discussed the new option of having 117 Associates sell its remaining land to AMCD and except (i.e., reserve) an easement area over the property which AMCD did not need to build its addition, which would allow AMCD to get the building permit and complete a satisfactory Land Court survey during the construction process. That same day, AMCD received a memo from W&B, its engineer. The memo further discussed the sale and easement option, noting that the survey would divide the land into an arrangement that would allow AMCD to have sufficient land to meet zoning requirements while returning the easement area to the control of the original owner. Otherwise, the property lines have to be established in Land Court prior to the issuance of a building permit. The memo included Exhibit D, showing the approximate Crowe plan property lines in conjunction with land owned by AMCD. While the memo stated AMCD still needed 3.6+/- acres of land to comport with the Crowe Plan, this figure included Lot 57 in that total. By this time, 117 Associates had already conveyed Lot 57 to AMCD. Therefore, AMCD needed roughly 3.2 extra acres to comport with the Crowe Plan property lines, an area consisting of the remaining Strip and an extra 1.6 acres of Lot 58 beyond the Strip. Ex. 1, ¶ 25; Exs. 30, 31. 36. By June of 1998, AMCD knew that it had not acquired record title to the remaining Strip from 117 Associates. Ex. 1, ¶ 26; Tr. 5:119, 160, 162. 37. On June 4, 1998, AMCDs Fuller sent Salzberg and Dalton a memorandum regarding a Proposed Land Purchase Agreement (Fuller Memo). The Fuller Memo included a diagram showing sublots marked as Areas A, B, and C. [Note 7] The Fuller Memo proposed an agreement which would allow AMCD to survey and subdivide the remaining land, [Note 8] i.e. the Strip, and to purchase, survey, and subdivide a further lot of an additional 1.6 acres in size from Lot 58 (identified in the memo, and hereinafter, as Area C). Area C, when added to area owned by AMCD and the Strip, would correspond to the land needed to proceed under the Crowe Plan. Ex. 1, ¶¶ 27, 28; Ex. 33; Tr. 5:185, 189-193, 201. 38. A June 15, 1998 memo from Bay State to AMCD indicated that AMC[D] will be meeting with Ed Salsberg [sic] and Bob Dalton next week to discuss in more detail the required real estate transactions. There is no evidence that this meeting took place, and I find that it did not. Ex. 35, p. 1. 39. AMCD and 117 Associates did not enter into any further agreement related to the transfer of the Strip or Area C. Ex. 1, ¶ 29; Tr. 1:116-17, 5:193-194, 202. 40. A disputed factual issue concerns whether the one-year period provided for in the 1996 Agreement to subdivide the Strip and obtain Land Court approval was extended by oral agreement of Salzberg and Gaggin. 41. When asked about an extension of the 12 month period, Salzbergs testimony indicates confusionhe continually referred to the 1996 Agreement. He stated: If it says so, then I agreed to it. As to any independent oral agreement between himself and Gaggin, Salzberg testified: I dont remember what I agreed to exactly with Mr. Gaggin. When confronted with his deposition testimony in which he stated there was an extension and Gaggin had come to him to ask for one, Salzberg testified at trial that he could not remember how long anything was extended for. Tr. 2:70-75. 42. Gaggin, on the other hand, testified that he and Salzberg orally agreed to extend the 12-month period to allow determination of the precise boundaries of the Strip once the addition was built. AMCD did not anticipate actually building the addition for another couple of years because the antenna business was starting more slowly than expected. Though he testified to multiple discussions with Salzberg, Gaggin could not recall the specifics of the conversation which led to the agreement, nor when an agreement was reachedother than it occurred before construction. He contradicted himself on extension lengthcharacterizing it as indefinite and also for an extra twelve months. He further admitted there was no writing memorializing an extension, notwithstanding that other agreements between the parties were in writing. When about the lack of written documentation, Gaggin testified, Its quite frankly an insult half the time to ask for it. He stated that obtaining a written agreement wasnt a big deal at the time. Tr. 3:213-214, 249-250, 253-254, 256-257, 4:11-13, 26, 51-52, 55. 43. In 2000, when Salzberg raised the issue to AMCD of the missed 12-month deadline, Gaggins response letter never mentioned any extension agreement, but instead referred to an administrative oversight. Exs. 58, 59; Tr. 4:23-26. 44. While Gaggins testimony was vague and somewhat contradictory regarding the substance of any agreement and when it occurred, and I do not credit his testimony that it was insulting to ask for written documentation, given that so many other agreements between the parties were, in fact, in writing, [Note 9] I do find that, at most, Salzberg orally extended the one-year period for an extra one to two years (i.e. until January 16, 1999). 45. On April 30, 1998, Jack vanKuilenberg of AMCD faxed Salzberg a memo entitled RE: Atlantics New Building concerning questions arising as AMCD proceed[s] with plans for new addition to the building. The memo inquired about a well and sought Salzbergs permission to push excess fill onto his land during the anticipated excavation. Salzberg provided AMCD the well information and responded Dont count on it to the fill inquiry. Ex. 26. 46. Fuller (of AMCD) assumed the role of keeping Mr. Salzberg informed and communicated with him by fax and phone about construction issues such as lot lines, the boundaries . . . our need potentially to have an alteration to the configuration of the additional acreage around the June 1998 time frame. Salzberg requested information about Department of Environmental Protection regulations from Fuller concerning the well. On or around June 1, 1998, Fuller faxed Salzberg a diagram indicating [AMCDs] current and proposed land layout and on June 4, 1998 sent him the Fuller Memo outlining the proposed land purchase agreement. This also included the DEP information. Exs. 29, 33; Tr. 5-118, 123, 125-126, 171-172, 217-218. Q: And do you recall if you spoke with Mr. Salzberg in June of 1998, beyond your letter [the Fuller Memo] understanding, about the possible need for additional land or alterations to the configuration of the additional acreage? A: We had a number of conversations about the  whether additional acreage would be required or that the layout of the agreed parcel would need to be changed. Q: And do you know if you or anyone else at Atlantic Microwave was speaking to Mr. Salzberg in June or July of 1998 about the time for conveyance of the additional acreage? A: Yes. That was  I think I mentioned previously that the plan was and conveyed to Mr. Salzberg that the most expeditious route would be to move forward with construction and then have the final survey completed at the conclusion of construction. Tr. 5:125-126. In the latter half of 1998, Fuller and Salzberg communicated approximately once per month on the phone during construction regarding various topics. Tr. 5:219-220. 48. Salzberg did not recall responding to the Fuller Memo, nor entering into any agreement with AMCD in June 1998. He testified: I dont think [Fuller] asked me anything [in the Fuller Memo]. Its just  its just information he gave me. When asked point blank if Mr. Salzberg agreed to the proposal in the Fuller Memo, Fuller testified: I dont recall having something in writing, but we had  I guess we had discussed it, and it had never become an issue. It never became an issue. It was never raised as an issue by Mr. Salzberg. I find that Salzberg never agreed on behalf of 117 Associates to the proposal set forth in the June 4, 1998 Fuller Memo. Ex. 33; Tr. 1:116-117, 5:193, 202, 205-206. 49. On June 18, 1998, AMCD represented in a letter to the Bolton Board of Selectmen that it had purchased all of the Additional Acreage, [Note 10] including the Strip, and was in the process of purchasing Area C. The letter further stated: [AMCD] presently controls by lease or outright ownership all land in question and the owners of [117 Associates] are in agreement of all facts discussed above. AMCD did not copy 117 Associates on this letter. The Board of Selectmen confirmed that the approval remained valid on June 24, 1998 and July 3, 1998, but warned AMCD that all work is done at your own risk. Ex. 1, ¶ 33; Ex. 32; Ex. 36, p. 1, 37; Tr. 5:202-208. 50. On July 7, 1998, AMCD applied for a building permit with the Town of Bolton Building Inspector. The application identified AMCD as the owner of 35.3 acres. Fuller signed the application on behalf of AMCD, but testified he did not know why it stated 35.3 acres, as AMCD still leased Parcel 2 at the time. 117 Associates did not sign it, nor was it provided a copy of the application by AMCD. Ex. 1, ¶¶ 34, 35; Ex. 38; Tr. 5:127. 51. AMCD proceeded to construct an addition to its building. Construction began in summer of 1998, and the building was put into service in approximately March of 1999. A portion of AMCDs building, as well as associated parking areas and other related structures, are located on the Strip, registered title to which is in 117 Associates. AMCD spent approximately $2.5 million on constructing the addition. Ex. 1, ¶¶ 34, 36- 37; Exs. 38, 75, 95; Tr. 2:146, 3:215, 4:74, 5:118, 136, 142, 144; View. 52. Neither Salzberg nor Dalton attended any construction planning meetings in 1998, and Dalton did no witness construction at the Bolton site. Although by the time construction started, Salzberg was already living in Hyannis, he acknowledged he might have been on site during construction and saw a construction vehicle there once. Fuller testified that Salzberg visited several times during construction. I find that Salzberg witnessed and was aware of the construction of the addition. Ex. 97, pp. 66-67; Tr. 1:107- 108, 2:88-89, 5:128, 170, 220-221. 53. AMCD had extended its initial lease term on Parcel 2originally set to terminate in 1997through October 1999. [Note 11] On June 24, 1999, AMCD sought to renew its lease on Parcel 2, which was set to expire on October 31, 1999. AMCD also informed 117 Associates that AMCD wanted to construct an antenna tower and remove trees on Parcel 2. Ex. 1, ¶ 38; Exs. 24, 41; Tr. 2:45, 3:220-221, 4:35-36. 54. Salzberg and Dalton were aware as early as 1994 that AMCD wanted to build an antenna on Parcel 2 and that trees would need to be removed because antenna testing requires a clear line of sight. Exs. 10, 12; Ex. 97, pp. 76-77; Tr. 1:122, 2:23-24, 45-46, 3:205-209, 4:45-46, 5-138. The Tenant shall have the right to build an antenna on Parcel Two and to remove trees necessary for the construction and operation of such antenna on the following conditions: (i) Tenant must give Landlord written notice prior to any commencement of any such activity together with a detailed description of the work to be performed and (ii) Landlord shall have approved of such work, provided such approval shall not be unreasonably withheld or delayed. Paragraph 15 of the Lease contains an explicit No Waiver Clause. Ex. 2, ¶¶ 5(c), 15. 56. On June 8, 1999, 117 Associates informed AMCD that 117 Associates would not renew the Lease on Parcel 2. The letter further stated: Please advise your troops to refrain from making any further unauthorized alterations, and plan to leave the property in good order at the termination of the existing lease. Ex. 1, ¶ 39; Ex. 43; Tr. 1:120-121, 123-124, 4:35-37. 57. AMCD cut trees on Parcel 2 in 1999. The cut was an extensive clear-cut, the precise date of which is not clear from the record. Based on the testimony of Carl Cathcart, 117 Associates expert arborist, that when he visited the site in May 2001 he observed two years of growth1999 and 2000on the previously cut trees but not yet a full year of 2001 growth, I find that the clear-cut took place in the spring of 1999. AMCD did not seek or obtain 117 Associates approval before it clear-cut the trees. Ex. 1, ¶ 40; Ex. 41; Tr. 3:71-74, 4:74-75; View. 58. 117 Associates decided not to renew the Lease on Parcel 2 (i.e., the rest of Lot 58 apart from the Strip) because it wanted to market its remaining land. In lieu of a lease extension, on August 4, 1999, AMCD offered to purchase 117 Associates entire remaining property in August 1999 for $325,900, which represented the assessed value less the previously purchased 2.2 acres. Salzberg counteroffered for $525,000, requesting a legally binding agreement by Sept[ember] 17, after which time it is our goal to sign up a realtor. On September 15, Gaggin proposed that AMCD would purchase 117 Associates property for $475,000, subject to the approval of the Cobham Board of Directors (Cobham Board). Salzberg conditionally accepted the offer on September 22, 1999, requesting a good faith deposit of 4% of the total sale sum between October 9 and November 1, 1999. Ex. 1, ¶ 41; Exs. 44, 45, 47, 48, 50; Tr. 1:121, 134-138, 2:91-93, 129-130, 4:28-29. 59. Gaggins whole purpose in negotiating with 117 Associates, which he did not disclose to Salzberg, was to ascertain a purchase price Salzberg would agree to, so that he could complete a business analysis on investment return for the Cobham Board. Gaggin was not an advocate of the $475,000 price, did not personally present the analysis to the Cobham Board, and further, once he completed his analysis, knew the board wouldnt accept it, but I told them Hey here it is. They wanted a number; they wanted an analysis, and I gave it to them. Tr. 4:28-33. 60. On December 7, 1999, Gaggin informed Salzberg by telephone that AMCD would not purchase 117 Associates land. The same day, Salzberg and 117 Associates sent a letter to Gaggin to confirm your telephone call and to remind you that 117 Associates has paid taxes on about 3 acres of property that [AMCD] allegedly owns. It further read: The property has not been registered in the town of Bolton, and according to Dave Fuller I have to wait an indefinite length of time for this issue to be resolved. Ex. 1, ¶¶ 42, 43; Ex. 52; Tr. 1:139-40, 2:93-96, 3:225-226. 61. On December 10, 1999, Gaggin sent a letter confirming that AMCD would not purchase 117 Associates land. He proposed that AMCD would reimburse 117 Associates for the taxes on the 2.2 acres we acquired from you in 1996. Gaggin also assured Salzberg that AMCDs surveyors had completed a plan and would submit it to Land Court this month. Ex. 1, ¶ 44; Ex. 53. 62. AMCDs surveyors, W&B, had first prepared a plot plan entitled Proposed Lot Lines Land in Bolton, Mass. dated April 22, 1999 (the April 1999 Plan) after the addition was completed. The April 1999 Plan is not a subdivision plan and is not signed. AMCD was to approve the new property lines prior to W&B creating a linen, which would be submitted to the Bolton Planning Board for endorsement, and then to the Land Court for registration. The April 1999 Plan depicted the remaining land to be conveyed in a 2.2 acre triangular configuration that was larger than the Strip. Exs. 39, 40. 63. W&B thereafter generated a subdivision plan entitled Plan of Land in Bolton, Mass Being a Subdivision of Land Court Plan 33731S, dated November 22, 1999 (the November 1999 Plan), which depicted the additional land to be conveyed as 2.23 Acres+/- (Triangular Parcel)i.e. 2.23 acres in addition to Lots 57, 59, 8, and 10. The Triangular Parcel is larger than the Strip and included additional land from Lot 58 (Parcel 2). It extends 301.5 feet into Lot 58 on its southeasterly end, whereas the Strip extended only 158 feet. The Triangular Parcel is also depicted in a different configuration than the rectangular Strip as shown on Lease Exhibit A-1 and Real Property Agreement Exhibit AA. The November 1999 Plan is not signed by the surveyor, but is rather stamped Draft. The draft November 1999 Plan was found in the Town of Bolton files, but AMCD appears never to have submitted a formal, signed plan for Planning Board endorsement. No plan was ever submitted to the Land Court for approval. Exs. 2, 3, 51; Tr. 2:143-144, 3:226. The Triangular Parcel is also shown on the 2013 Ducharme Plan that is attached hereto as Exhibit D.
64. On December 18, 1999, Salzberg, on behalf of 117 Associates, faxed Fuller a letter stating that if you bought 2.2 of 28.4 acres then . . . .08397 of each tax bill we paid, should have been paid by [AMCD]. On Dec. 21, 1999, AMCD sent a check for $2,100 to 117 Associates. Salzberg cashed the check. Ex. 1, ¶¶ 44, 45; Ex. 54; Tr. 1:144-145, 2:106, 3:226-227, 4:64-65, 5:133-134. 65. In mid-February 2000, Salzberg wrote to Fuller, stating he was slightly confused and trying to get my act together regarding AMC[D]-117 [A]ssoc[iates] properties. Salzberg requested a copy of the land transfer agreement and a copy of the latest drawing, as the last one he received was the April 1999 Plan. [Note 12] Ex. 57: Tr. 2:7, 10-11. Dalton sent Fuller a copy of the duplicate certificate of title in late February, which he had orally requested in December 1999. Ex. 56; Tr. 5:170-171, 224-226. 66. Sometime between December 1999 and February 29, 2000, Salzberg called Fuller to ask if he had ever signed a building permit. Fuller informed him he had not. Tr. 5:136-137. 67. Thereafter, in a February 29, 2000 letter, Salzberg informed Gaggin that he and Dalton had only recently discovered that the option to acquire the Strip, per the 1996 Agreement, expired on January 16, 1997 and thus, part of Atlantics new building is on 117 Industrial Associates property. Dalton discovered this while looking back through old documents and informed Salzberg. Ex. 58; Ex. 97, p. 90. 68. Gaggin wrote to Salzberg on April 14, 2000 that the additional acreage . . . rightfully belongs to AMCD per the 1996 Agreement and all that remains is the formality of recording the transfer. The letter listed reasons that bear this fact out, but was silent on any alleged agreement to extend the 12-month period. 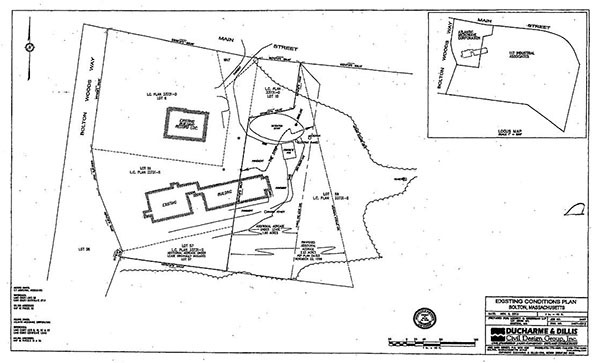 Gaggin reiterated that a proposed plot plan was ready for Land Court, and further stated: I do not believe an administrative oversight that cost you nothing should have any bearing on our agreement. David Fuller, also of AMCD, referred to the failure to survey the property as an oversight in a letter to the Town of Bolton on April 26, 2000. Exs. 59, 62; Tr. 4:22-26. 69. Salzberg requested a copy of the proposed plot plan; Gaggin sent him the April 1999 Plan. Salzberg did not see a copy of the November 1999 Plan until he went to Town Hall and requested information on AMCDs ownership. Exs. 60, 61; Tr. 2:8. 70. After the creation of the April 1999 Plan, several documents sent between the parties referred to or depicted the additional land to be conveyed as 2.2 acres. Salzberg did not object to this characterization until his February 29, 2000 letter. See Exs. 41, p. 2; Exs. 45, 53, 54; Ex. 61, p.2; Tr. 3:224-225. 71. The relationship between the parties broke down entirely in the year 2000. AMCD operated at the Bolton site until 2011, when its business assets were transferred to another Cobham entity and operations were moved to Lowell, Massachusetts. Other than a small amount of storage in one building, neither AMCD nor Cobham use the Bolton site. AMCD has been paying for upkeep and taxes on the buildings since 2011. Tr. 5:146- 150, 228-229; View. 72. AMCDs Lease on Parcel 2 expired on October 31, 1999. Prior to the Leases expiration, AMCD had been shooting frequencies towards a temporary antenna on Parcel 2, which was a portable, two-wheel cart. I find that after expiration of the Lease, AMCD began using an indoor range inside the addition and also built a new, shorter outdoor antenna range on Parcel 1. The new outdoor range looks east to west from an antenna on the addition to another on top of the existing building. Ex. 1, ¶ 47; Ex. 53; Tr. 2:52, 3:220-221, 5:135-36, 138-39; View. AMCD did not, however, immediately remove the portable antenna from Parcel 2. Photographs from approximately early 2000 show the portable antenna still on Parcel 2. Salzbergs attorney twice sent an invoice to AMCD, in November 2000 and March 2001, seeking use and occupancy amounts based on the continued use of Parcel 2 and the presence of antenna testing equipment. AMCD did not pay 117 Associates any money in response to these invoices. I find that the portable antenna was present on Parcel 2 until at least March 5, 2001. [Note 13] Exs. 63, 67, 69, 84; Tr. 2:16-17, 3:221. 73. Paragraph 14 of the Lease provides, in relevant part, that a tenant remaining in possession of the premises after the Lease expired without written permission of the landlord shall be deemed a tenant at sufferance, and liable during the holdover period for two times the highest rent payable during the Lease term plus any Additional Rent, as that term is defined in the Lease. Ex. 2, ¶ 14. 74. During the lease term, the highest rent for Parcel 1 was $12,000; the highest rent for Parcel 2 was $2,083. As defined in the Lease, Additional Rent included, inter alia, real estate taxes, assessments, water and sewer charges, other governmental levies, and also impositions, except that the landlord was responsible for real estate taxes on Parcel 2. Ex. 2, ¶¶ 3(b)(iii), 4(a), (b). 75. 117 Associates paid taxes on the entirety of Lot 58 from 2000-14. AMCD attempted to pay additional taxes on 2.2 acres after its initial tax payment in December 1999, but Salzberg did not cash the check. Ex. 87; Tr. 5:133-34. 76. Numerous constraints limit development of 117 Associates 28.4 acre property (i.e. Lot 58/Parcel 2). It is zoned industrial, allowing such uses as office space or research and development, but not residential uses. The bylaw permits a maximum lot coverage of eight percent (8%) and maximum building height of thirty-two (32) feet above grade. The bylaw also requires one square foot of parking for each buildable square foot. The site topography includes a steep hillside with significant exposed bedrock outcroppings, meaning bedrock excavation is required for development. There is no municipal water supply in the Town of Bolton, so any site development requires digging a well, leaving a sufficient protective radius surrounding it per Department of Environmental Protection (DEP) regulations. The site also lacks sewer access, so a septic system is necessary along with leaching fields. If more than 10,000 gallons per day of waste are producedcalculated for design purposes at 75 gallons per 1,000 square feet of buildingDEP regulations require an onsite wastewater treatment plant. Ex. 77, pp. 1-3; Ex. 91; Tr. 4:87-89, 92-102, 109, 112-114, 123, 144-145, 150, 152-153; View. 77. Laurence Beals (Beals) testified on behalf of AMCD regarding the maximum development potential (assuming no building encroachment by AMCD) for 117 Associates property. Beals is president of Beals Associates, Inc.a land planning and engineering consulting firm specializing in civil engineering, land planning, landscape architecture and surveyingand has over thirty years of experience as a development consultant. Beals conducted three (3) site visits and gathered relevant data regarding zoning requirements, topography, surficial soil data, etc. to create three conceptual designs for office developments (Concepts A, B, and C) that accord with the Town of Bolton Zoning Bylaw (zoning bylaw). Exs. 77, 91; Tr. 4:77-78, 80, 84-85, 87-88, 90-91, 97-98. 78. Development of 117 Associates property would require significant premium site costs, such as bedrock excavation or underground parking, which exceed the approximately $20 per square foot for standard construction costs. [Note 14] To glean construction costs, Beals used the RS Means 2013 Construction Cost Data and previous project experience by Beals Associates, Inc. Ex. 77; Tr. 4:101-105, 123-125, 175-177. 79. Concept A represents the largest possible development on 117 Associates property under the zoning bylawa two-story office building with an approximately 100,000 square foot building footprint. [Note 15] It requires, among other things, underground parking (due to space constraints), a wastewater treatment facility, and installation of extensive retaining walls. The premium site costs for Concept A totaled $30,000,000 or $150.00 per square foot (in addition to the standard $20 per square foot). These include, for example: $25,000,000 for an underground parking garage; $2,500,000 for retaining walls; and $1,500,000 for a septic system and wastewater treatment plant. Ex. 77, pp. 4-5; Ex. 91, Concept A; Tr. 4:95-96, 102-103, 125, 127-131, 133, 135, 140. Concept B represents a smaller office development, i.e. a two-story building with a footprint of 60,000 square feet, whichbecause of its smaller sizedoes not require underground parking, a treatment plant, or nearly as many retaining walls. The total premium costs for Concept B are $3,200,000 or $27.00 per square foot (in addition to the $20 per square foot standard construction costs). Ex. 77; Ex. 91, Concept B; Tr. 4:144- 145, 147. Concept C is a two-story office building with a footprint of 50,000 square feet designed to eliminate the necessity for retaining walls, rip rap, garage parking, or a treatment facility. The total premium costs for Concept C are $2,200,000 million or $22 per square foot (in addition to the $20 per square foot standard costs). Ex. 77; Ex. 91, Concept C; Tr. 4:124-125. 80. Each concept requires significant tree removal costs, and none account for additional costs for fire protection, potential wetlands, or natural gas. Tr. 4:142-143. 81. I credit Bealss testimony that, while it is physically possible to develop Concepts A-C, the associated premium costs are so excessive that it would not be economically feasible to develop an office or industrial building on this site. 117 Associates put forth no countervailing expert opinion on development potential. I accept and credit Bealss testimony that even if there was an extraordinary factor attracting a developer to this particular site, developers would pay, at most, 10-20% above standard construction costs. Here, even Concept Cs $22 per square foot premium cost was over 100% more than the standard cost per square foot. I further credit Bealss testimony that an economically feasible alternative for this site would be a substantially smaller building, one small enough to accommodate a small-scale septic system, a small-scale well and a minimum amount of earthworks. Tr. 4:119-120, 124-125, 140-141, 152, 166-167. 82. David Cary (Cary) testified on behalf of 117 Associates. He is a licensed Certified General Real Estate Appraiser and has been an appraiser since 1987. Cary received the MAI (Member of Appraisal Institute) designation. Cary appraised the value of 117 Associates 28.4 acre property (Lot 58)a vacant site with the exception of the AMCD building encroachment on a portion of Lot 58. He visited the property on May 7, 2003 and prepared the appraisal dated September 13, 2005. The effective dates of the appraisal are December 31, 2000 and May 7, 2013. Ex. 72; Tr. 2:175-178. 83. Christopher Bowler (Bowler) testified for AMCD. He has been an appraiser since 1987 and received his Certified General Real Estate Appraiser License in 1992. Bowler holds the MAI and SRA (Senior Residential Appraiser) designations and has appraised a variety of commercial properties. Bowlers office is located several miles from 117 Associates and AMCDs properties, and he is familiar with the Bolton area and its history of development since 1998. Bowler appraised a total of 33.03 acres117 Associates 28.4 acre property (Lot 58) and AMCDs 4.63 acre property (Parcel 1 less the Strip) in three different configurations. He visited the site on June 4, 2013 and several times afterwards and prepared the report dated June 26, 2013. The effective dates of the appraisal are July 1, 1998 and June 14, 2013. Ex. 74; Tr. 4:215-218; 238-240. 84. In 1998, the commercial real estate market was strong in the Greater Boston metropolitan area, including the submarket along Interstate 495, with low vacancy rates and rising rents. The dot-com boom was in full effect, and there was construction of new commercial and industrial buildings. The demand for office development sites around I-495 peaked in 2000, though the market changed significantly in 2001 with the dot-com crash and the September 11, 2001 terrorist attacks. Exs. 72, 74; Tr. 2:187-189, 3:14, 35-36, 56-57, 60-61, 4:263-267. 85. 117 Associates 28.4 acre parcel (Lot 58) is located approximately 2 miles from I-495 in the rural residential and farming community of Bolton, Massachusetts. Lot 58 is situated outside the towns main business district and is not located in a traditional commercial or industrial park. Other than AMCDs and 117 Associates properties at issue, the only other industrially-zoned site in Bolton is the former Future Electronics site across Main Street. Exs. 72, 74; Tr. 2:192-193, 4:217-218, 227, 236, 238-240. I find that 117 Associates 28.4 acre property is a marginal location for a commercial or industrial building, both presently and during 1998-2000. 86. Both appraisers performed a highest and best use analysis (HBU) and used the Sales Comparison Approach [Note 16] to estimate market value. HBU is the optimum use of the property that is: (1) physically possible; (2) legally permissible under zoning and other restrictions; (3) financially feasible; and (4) maximally productive. Both appraisers assumed marketable title for appraisal purposes. Exs. 72, 74; Tr. 2:178-179, 200-201, 4:225-226, 234, 269, 5:5-8. 87. Cary appraised the 28.4 acre Lot 58 based on three (3) different scenarios. Scenarios 1 and 2 were appraised as of December 31, 2000; Scenario 3 was appraised as of May 7, 2003. Scenario 1 assumed no tree clearing and no encroachment by AMCD with the HBU being office development. The total estimated market value was $2,970,000 for a two-story office building with 197,936 total square feet (the largest configuration allowed under the bylaw). Cary opined that the property would have made for an attractively- wooded parcel optimal for development of a Class-A office site or corporate headquarters. Scenario 3 again accounted for the tree clearing and encroachment with industrial use deemed to be the HBU, given the change in the market since 2000. The estimated market value was $490,000 [Note 18] for a 98,968 buildable square foot industrial building. Ex. 72, p. 1-2, 24, 34-39 (Scenario 1), 39-44 (Scenario 2); 44-49 (Scenario 3), 50; Tr. 2:177, 180-189, 204, 3:35-36. 88. Bowler appraised three different configurations of 117 Associates and AMCDs properties as of July 1, 1998 and June 14, 2013, though I find only Scenarios 2 and 3 relevant, as they pertain to 117 Associates 28.4 acre property. [Note 19] He deemed the HBU for both scenarios to be owner-occupancy or build to suit, [Note 20] due to the sites distance from I-495 and physical flaws which constrain development. Ex. 74, pp. 10, 24- 25, 42-43, 4:222-223, 226-228, 235, 267-268. Scenario 2  Value of Lot 58A (26.17 acres): the appraisal value of 117 Associates registered Lot 58, less the 2.23 acre Lot 60 shown on the November 1999 Plan of which AMCD claims ownership. The estimated market value was $210,000. Scenario 3: Value of Lot 58A (26.17 acres) plus Lot 60 (2.23 acres): i.e. 117 Associates 28.4 acre Lot 58. The estimated value was $285,000. The inclusion of the 2.23 acres increased the purchase price because its topography was slightly better than the remainder of Lot 58. Ex. 51; Ex. 74, p. 9, 19, 25, 24-25, 38-42, 43-45; Tr. 4:221-223, 244, 5:9-10, 18-19. 90. Cary testified that for his appraisal of 117 Associates property, he did no analysis regarding the physical buildability of the site and assumed it was financially feasible to build for the intended use in each scenario. Notably, Cary stated in his report that any R&D use or industrial use building would likely be developed as a one-story building, as is typical in the market. Both Scenarios 2 and 3 rely on a buildable square footage of 98,968 square feet in calculating the estimated appraisal value. In each instance, a one-story 98,968 square foot building is significantly larger than the 60,000 and 50,000 square building footprints which Beals determined to be economically infeasible in his Concepts B and C, respectively. I do not credit this assumption. Rather, as discussed in Findings of Facts ¶¶ 73-78, I find that it is not economically feasible to build a large commercial or industrial development on this site in any of Carys three scenarios. Ex. 72, pp. 24, 44, 49-50; Tr. 2:205-206, 3:18, 44. 91. I instead credit Bowlers testimony and report. Bowler chose comparable properties more similar to 117 Associates property, accounting for secondary locations and physical limitations, whereas Cary used comparable properties superior in location and physical characteristics. Bowler used a price per acre (PPA) unit of comparison; Cary used a buildable square foot (BSF) unit. I find the PPA unit is more appropriate than the BSF unit when appraising raw acreage with no approvals in place, as is the case here. Ex. 72, pp. 34-35, 39-40, 44; Ex. 74, p. 42; Tr. 3:20-21, 36-37, 63, 4:228-229, 233-234, 241-242, 250-56. 92. Cary stated in his report and testified at trial that, in regards to the market in the year 2000, there were still several more desirable office sites than 117 Associates property which were not developed in the last market peak of 2000. Given the more desirable properties available at the height of the market, combined with the economic infeasibility of developing 117 Associates property for anything other than a small-scale building as described in Finding of Fact ¶ 78, I do not credit Carys appraisal values for the year 2000. [Note 21] Ex. 72, p. 20; Tr. 2:213-214, 3:63-64. 93. Salzberg himself was willing to sell the property to AMCD in 1999 for $475,000approximately $2.5 million less than Cary appraised it at in 2000 (Scenario 1), as Cary acknowledged on cross-examination. Ex. 50; Ex. 72, p. 39; Tr. 3:16-17. 94. I additionally find Bowlers opinion to be generally consistent with a market value summary appraisal obtained by Salzbergs partner, Dalton, in 2011. Conducted by Joseph Green, MAI, this appraisal likewise deems the HBU to be owner- occupancy, uses the Sales Comparison Approach, and accounts for site limitations in comparable properties. This appraisal values 117 Associates 28.4 acres at $225,000. Bowlers 2013 appraisal values for Scenarios 2 and 3 were also in the low hundred thousands. [Note 22] Exs. 73, 74. 95. I find the value of 117 Associates 28.4 acre property to be $285,000 as of 1998. I find the value of the 117 Associates 26.17 acre property (Lot 58 minus the 2.23 acres AMCD alleges ownership of) to be $210,000 as of 1998. 96. The trees that were cut on 117 Associates property in a forested area included large hickory, oak, and maple trees, along with many understory trees, i.e. smaller trees that live under the existing forest canopy. The new growth in the cut area is entirely different than what once stood there. It now consists of low-value, aggressive poplar species and stump sprouts, which grow quickly but do not fare well. It is impossible to replace the forested area as it once was. Ex. 71, p. 13-15; Ex. 92; Tr. 3:123-130, 132-134, 5:90-91, 93-94, 97-99; View. 97. Carl Cathcart (Cathcart), owner of A Plant Health Care Consultant and a Massachusetts certified arborist since 1959, testified for the Plaintiff as to the value of the trees cut by AMCD. Cathcart conducted four site visits in 2001 and prepared an expert report for trial. [Note 23] He used the cost of cure appraisal method, which essentially considers the species and size of the cut trees, the cost to buy and install similar replacement trees, and adjusts plant costs downward for plant condition, location, and species percentages. It further includes a years to parity calculation, which provides a value using annual compound interest for the years a replacement tree takes to grow back to the original height of the cut tree. [Note 24] Finally, this method accounts for site restoration costs, i.e. costs necessary to return the property to its original condition. [Note 25] Ex. 71, pp. 2, 5, 7-9, 13-15; Tr. 3:66-68, 89, 91-115, 117, 5:84. 98. Cathcart opined that AMCD removed approximately 757 trees from 117 Associates property and estimated the total damage at $1,297,890.20, which includes $1,230,556.90 in total tree loss and $67,333.33 in site restoration costs. Cathcart, along with surveyors from Ducharme & Wheeler, located and measured 364 tree stumps remaining on 117 Associates land (Stumped Area). The Stumped Area covers portions of both the Strip and Parcel 2, with approximately 30% of the Stumped Area lying within the Strip. Cathcart applied the cost of cure analysis, including a years to parity calculation for each tree, for a total lost value of $591,707.93. 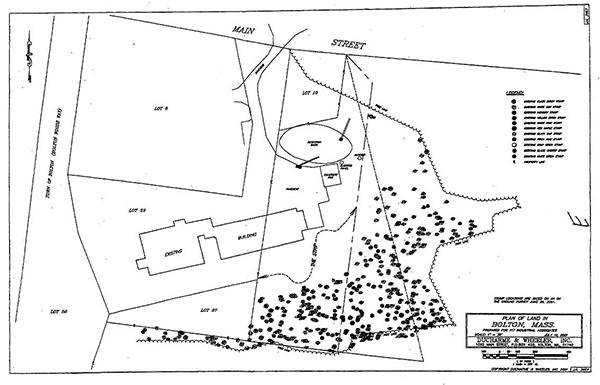 To determine the numbers of trees previously cleared by AMCD during construction (denoted as Cleared Lot 60 in Cathcarts report), he applied the ratio of trees per square foot in the Stumped Area to the known square footage of the Non-Stumped Arearesulting in an estimated 393 trees cleared for a total lost value of $638,849.01. Ex. 70; Ex. 71, pp. 1-3, 11; Tr. 3:70-71, 84-86; 90-91, 114-121, 137-140, 145-146. A copy of a plan showing the Stumped Area, the Strip and the relevant portion of Parcel 2 is attached as Exhibit E.
99. Robert Billing (Billing), a Massachusetts certified arborist since 1979 and owner of South Shore Arborists, testified as the Defendants expert arborist. He conducted three site visits in 2013-14 and prepared two expert reports for trial. Billing could not complete a cost of cure analysis, given the significant lapse of time since the tree cutting occurred. [Note 26] Instead, he examined a 115 x 140 foot wooded area on 117 Associates property (Alternate Tree Parcel), located near and deemed most similar to the cut area. Billings reports summarized his observations on the health and condition of the trees in the Alternate Tree Parcel, and additionally, identified problems with Cathcarts application of the cost of cure method. Exs. 76, 78; Tr. 5:29-30, 32-33, 67-68, 77, 85-86, 99-101. 100. Billing opined that Cathcarts plant location adjustment of 50% in the cost of cure analysis was too high for a forested area, particularly where the cut portion of the forest bears no particular importance compared to the whole. I credit Billings testimony that an appropriate location adjustment here is a thirty-percent (30%) maximum. Ex. 76, p.1; Ex. 78, p. 4; Tr. 5:52. 101. The cost of cure method is widely accepted by professional arborists and recognized in the Guide for Plant Appraisal, 9th Edition (Plant Guide). Billing testified that there is some discrepancy among arborists in the application of the years to parity calculation. While a parity calculation is appropriate in certain instances, such as for an important tree in a residential landscape that a homeowner may never see again once cut, it must be used with discretion. Billing opined that compounding to parity for hundreds of trees in a forested area is extremely unreasonable. Exs. 76, 78; Tr. 5:52-53, 60-64, 84- 85. 102. The Plant Guidethe authoritative industry sourcedirects that appraisals must be reasonable, particularly as compared to actual property values. It instructs the appraiser to consider the contribution the landscape brings to the property in analyzing the total market value, given that plants are part of the real estate. Billing testified that only in extremely rare instances would the tree appraisal value exceed the property value itselffor example, in the case of a 400 year old tree situated on a very inexpensive property. Cathcart admitted he had no knowledge of the property value, but nonetheless determined the tree appraisal value for approximately 3 acres of cut trees was $1,297,890.20. As of 1998, the total property value for the 117 Associates 28.4 acres was approximately $285,000. Exs. 76, 78, 93; Tr. 3:91, 166-167, 5:48; Findings of Fact ¶ 95. 103. An arborist, when conducting an appraisal, must take into account the intended use of the property. Cathcarts report and testimony assume that 117 Associates intentionally preserved the forest to act as privacy screening for the commercial complex it intended to develop on Parcel 2. On cross-examination, Cathcart acknowledged that if the property could not be developed, the cost of cure method would be inappropriate, as would the application of years to parity. As discussed above in Findings of Fact ¶¶ 73-78, I find that the property cannot be economically developed into a large commercial office building or industrial complex as Salzberg envisioned. Ex. 71, p. 6; Tr. 2:124-126, 3:91, 140-142, 166, 181-183. 104. I ultimately credit Cathcarts cost of cure analysis as a means for assessing tree value, since the property can be developed, though not as a large commercial complex. However, I also credit Billings testimony that the plant location adjustment is 30%, maximum, and that compounding to parity for hundreds of trees in a forest is extremely unreasonable, particularly where the resulting value grossly exceeds the property value. I further find this is not a unique situation in which the tree appraisal value could exceed the property value. Exs. 71, 76, 78, 93; Tr. 4:119-20, 125-126, 152, 166-167, 5:52, 60-64, 84-85. 105. Reducing the Plant Location Adjustment to 30% and removing the parity analysis, the reduced calculation for the 364 trees in the Stumped Area is $78,143.77, plus $67,333.33 in average site restoration costs. Ex. 70; Ex. 71, pp. 1-3, 11; Tr. 3:78-80, 84-86, 114-121, 137-140, 145-146. This action centers on 117 Associates allegations of trespass and encroachment by AMCD and AMCDs counterclaims that they are entitled to title of the Additional Acreage because of a contract between 117 Associates and AMCD. Resolution of these issues requires that I first analyze AMCDs counterclaim, as resolution of AMCDs contractual claims are a necessary predicate to deciding the ownership and title issues. Count I of AMCDs counterclaim alleges that 117 Associates materially breached its obligations to AMCD under the 1994 Real Property Agreement and the 1996 Agreement by failing to transfer the Strip. To recover on a breach of contract claim, AMCD must prove: (1) there was a valid contract between AMCD and 117 Associates; (2) AMCD was ready, willing, and able to perform; (3) 117 Associates breached the terms of the contract; and (4) the breach caused AMCD to suffer damages. Singarella v. City of Boston, 342 Mass. 385 , 387 (1961); Bose Corp. v. Ejaz, 732 F.3d 17, 21 (1st Cir. 2013) (applying Mass. law); Amicas, Inc. v. GMG Health Sys., Ltd., 676 F.3d 227, 231 (1st Cir. 2012) (applying Mass. law). For a purported contract to be valid and enforceable, the parties must have reached agreement on all material terms and have had a present intention to be bound. Situation Mgmt. Sys. v. Malouf, 430 Mass. 875 , 878 (2000); McCarthy v. Tobin, 429 Mass. 84 , 87 (1999). Additionally, under the Statue of Frauds, a contract for the conveyance of land is not enforceable unless it is set forth in writing executed by the person to be charged. G.L. c. 259, § 1, Fourth. The Real Property Agreement and the 1996 Agreement are contracts for the conveyance of land and thus, on their face, are subject to the Statute of Frauds. [Note 28] I will therefore start with the terms of the parties written contracts. Enforceable Contract. The 1994 Real Property Agreement gave AMCD the option to purchase Parcel 1, which it was then leasing under the Lease, between January 1, 1995 and April 30, 1996. Exs. 2, 3. AMCD exercised that option in December 1995 and AMCD and 117 Associates reached an enforceable agreement on all materials terms for the conveyance of Parcel 1 in January 1996. It is undisputed that both the Real Property Agreement and the 1996 Agreement were valid and enforceable contracts in writing. The terms to which they agreed were that AMCD would pay $870,000 (the full purchase price agreed on in the Real Property Agreement) to 117 Associates for all of Parcel 1. In exchange, 117 Associates would convey Lots 8, 10, 57, and 59 contemporaneously to AMCD and would convey the remaining Strip portion of the Additional Acreage (the portion of Lot 58 still registered to 117 Associates) for no additional consideration upon AMCDs obtaining approval of a subdivision plan. Paragraph 2 of the 1996 Agreement specifically provided that AMCD shall use reasonable efforts to complete and obtain approval of a subdivision plan in Land Court within (12) months. Ex. 22, ¶ 2. Breach. Under the terms of the written agreement, 117 Associates failure to convey the Strip was not a breach of contract because AMCD failed to obtain an approved subdivision plan within one year of the 1996 Agreement. A condition precedent defines an event which must occur before a contract becomes effective or before an obligation to perform arises under the contract. If the condition does not occur, the contract, or the obligations attached to the condition, may not be enforced. Twin Fires Inv., LLC v. Morgan Stanley Dean Witter & Co., 445 Mass. 411 , 420-21 (2005) (citations omitted); Wood v. Roy Lapidus, Inc., 10 Mass. App. Ct. 761 , 763 n.5 (1980) (A condition precedent is an act which must occur before performance by the other party is due.). Generally, emphatic words [Note 29] are used to create a condition precedent, but are not absolutely necessary. Massachusetts Mun. Wholesale Elec. Co. v. Town of Danvers, 411 Mass. 39 , 45 (1991), citing Malden Knitting Mills v. United States Rubber Co., 301 Mass. 229 , 233 (1938). In the absence of the usual words, a condition precedent may nonetheless be found to exist if the intent of the parties to create one is clearly manifested in the contract as a whole. Id. at 46. AMCDs preparing and obtaining an approved subdivision plan within one year was a condition precedent to 117 Associates obligation to convey the Strip under the 1996 Agreement. Paragraph 2, which creates the subdivision approval requirement, lacks the usual words necessary to create a condition precedent. However, the parties explicitly acknowledge on Page 1 that a portion of Parcel 1 could not be conveyed until certain events occurred, including "until a subdivision plan has been prepared by a registered land surveyor or engineer . . . and filed with and approved by the Land Court. Ex. 22, p. 1. Because Parcels 1 and 2 involved registered land, the Strip would not exist on record until it was subdivided out of Lot 58. 117 Associates could not, in fact, convey title unless and until the subdivision plan was approved by the Land Court. It is undisputed that AMCD did not complete and obtain approval of a subdivision plan within twelve (12) months of January 1996 Agreement. Ex. 1, ¶ 21. Thus, 117 Associates obligation to convey the Strip never arose. There was no breach under the written contract terms. Waiver of 1-Year Condition. AMCD argues that 117 Associates and Salzberg waived, both expressly and impliedly, the one-year condition. The 1996 Agreement lacked a no waiver clause, thereby allowing the parties to waive terms. See Ex. 22. Waiver is the intentional relinquishment of a known right . . . or as one commentator has explained, the excuse of the nonoccurrence of or a delay in the nonoccurrence of a condition of a duty. Dynamic Mach. Works, Inc. v. Machine & Elec. Consultants, Inc., 444 Mass. 768 , 771 (2005) (internal citations omitted). Conditions and clauses of a contract may be waived, either expressly or by words and conduct. Owen v. Kessler, 56 Mass. App. Ct. 466 , 470 (2002) (internal citations omitted); McCarthy, 429 Mass. at 88- 89. Waiver may occur by an express and affirmative act, or may be inferred by a partys conduct, where the conduct is consistent with and indicative of an intent to relinquish voluntarily a particular right [such] that no other reasonable explanation of the conduct is possible. KCAT, Inc. v. Rubin, 62 Mass. App. Ct. 689 , 695 (2004) (internal quotations omitted). A waiver inferred by a partys conduct is an implied waiver. An implied waiver must be based on clear, decisive, unequivocal conduct. Id. Waiver is usually a question of fact. McCarthy, 429 Mass. at 88 n.5. AMCD argues there was an express waiver because Salzberg and Gaggin orally extended the subdivision approval period. Early on, in 1996, they discussed extending the subdivision approval period beyond the original one-year term (which ended on January 16, 1997). Gaggin testified this was because AMCD wanted to wait until it identified the parameters of its proposed addition to determine the exact amount of additional land it required, and did not anticipate building the addition for a couple of years because the antenna business was starting more slowly than expected. Tr. 3:211-213, 254, 256. AMCD did not, in fact, proceed with construction of any addition in 1995-1997. Salzberg acknowledged the time for conveyance was extended, but could not recall for how long. Tr. 2:73-75. I find that, at most, Salzberg expressly extended the subdivision approval period for an extra one to two years, i.e., to January 1999. Notwithstanding any express extension, Salzberg also acted in a way so as to impliedly waive the one-year requirement. In early 1998long after the original January 16, 1997 deadline had passedAMCD restarted its building addition project. AMCD maintains Salzberg impliedly waived the one-year condition because he knew of the building expansions plans, was kept informed on construction issues and progress by Fuller, and then in 1999 requested AMCD pay taxes on the 2.2 acres and cashed the check. [Note 30] Waiver is judged by an objective assessment of the conduct of the party alleged to have relinquished its rights, not by the subjective expectation of the person who would benefit from the waiver. Dunkin Donuts Inc. v. Panagakos, 5 F. Supp. 2d 57, 60 (D. Mass. 1998). Parties continued dealings with each other after a missed deadline, lack of objection to a missed deadline, and continued acceptance of payments have been deemed conduct sufficient to create an implied waiver of a condition. See McCarthy, 429 Mass. at 88-89 (continued dealings after deadline passed and lack of objection to missed deadline constituted waiver); Church of God in Christ, Inc. v. Congregation Kehillath Jacob, 370 Mass. 828 , 833-835 (1976) (oral extension, continued dealings after deadline, and acceptance of payments constituted waiver). The question is whether Salzbergs conduct in 1998 objectively indicated to AMCD that he was waiving, on behalf of 117 Associates, strict enforcement of the one- year subdivision approval requirement. In April 1998, Jack vanKuilenberg of AMCD faxed Salzberg a memo entitled RE: Atlantics New Building, regarding questions arising as [AMCD] proceed[s] with plans for a new building, including information on a well and whether AMCD could push excess fill onto Salzbergs adjacent land. Salzberg responded with the information sought. Ex. 26. He later asked Fuller for information on DEP regulations as to the well. Ex. 33; Tr. 5:117-118. Fuller provided the DEP information in the Fuller memo, along with additional information about the Additional Acreage (Lot 57 and the Strip), Area C, and sketches of AMCDs plans (which clearly depict the proposed addition extending onto the Strip). Salzberg and Fuller also had multiple discussions in 1998 about the non-conveyance issue and the possible need to alter the configuration of the Strip. Though Salzberg never responded to the Fuller memo and no additional agreement was reached as to the Strip or Area C, he at no time objected to AMCDs proceeding with its construction plans, nor raised the expiration of the one-year time limit as a bar to its doing so. I find that Salzbergs conduct and continued dealings with AMCD indicated a willingness to go forward under the 1996 Agreement notwithstanding AMCDs failure to previously obtain a subdivision plan strictly within one year. See McCarthy, 429 Mass. at 88-89; Church of God in Christ, Inc., 370 Mass. at 833-835. I do not, however, concur with the full theory AMCD urges upon this courtthat any waiver by Salzberg provided them with an indefinite time for performance, allowing AMCD, at its leisure, to build its addition on registered land it did not own and obtain a subdivision plan at some unidentified point in the future, with no outside time limit for doing so. At most, Salzberg, in his early discussions with Gaggin, expressly waived the limit for an additional one to two years, i.e. to January 1999. Moreover, even where there is an implied waiver of a condition and the original time for performance has passed, cases recognize subsequent performance which is timely and within reason. McCarthy, 429 Mass. at 89; Church of God in Christ, Inc., 370 Mass. at 835. An indefinite time for performance is inconsistent with such a proposition. While not unlimited, I nevertheless find that the implied waiver extended to the date of the filing of the complaint in 2001. AMCD, as part of its contention that the one-year period was extended, also maintains that it reached an agreement or understanding with Salzberg, on behalf of 117 Associates, that AMCD could identify the exact land to be conveyed once the addition was built, and at that time would complete the subdivision plan; or, alternatively, that Salzberg essentially knew of their intention to do so and waived any objection to it. Tr. 3:211-212, 214, 254-256, 5:122-123, 125-126, 183-184. Paragraph 1 of the 1996 Agreement identifies the remaining land to be conveyed as the portion of Lot 58 shown on Plan 33731S . . . and shown as crosshatched on Exhibit A to the Real Property Agreementi.e. the 1.6 acre Strip. Ex. 22. AMCD now asks this court to order 117 Associates to cooperate in the preparation of a subdivision plan and order the conveyance of the 2.23 acre Triangular Parcel shown on the November 1999 Plan, or alternatively, order the same as to the 1.6 acre Strip. The contention that Salzberg agreed that AMCD could identify the land in the future is distinct from the argument that the subdivision approval period was waived and extended beyond one year. Such an agreement, if any, goes to the term of the contract identifying the land to be conveyed, rather than the separate contract provision of time for performance. This is an important distinction. Whether AMCD is entitled to conveyance of the Triangular Parcel it seeks depends on whether it reached an enforceable agreement to alter the amount of land to be conveyed under the 1996 Agreement from the Strip to the Triangular Parcel. Agreement of the parties on all material terms is necessary for an enforceable contract. Dennis v. Kaskel, 79 Mass. App. Ct. 736 , 741 (2011); Situation Mgmt. Sys., 430 Mass. at 878; McCarthy, 429 Mass. at 87. The essential terms of a contract must be definite and certain so that the intentions of the parties may be discovered, the nature and extent of their obligations ascertained, and their rights determined. Lucey v. Hero Intl Corp., 361 Mass. 569 , 574 (1972); Cygan v. Megathlin, 326 Mass. 732 , 733-734 (1951). An adequate description of the land to be conveyed is an essential and material term of a contract to convey real estate. See McCarthy, 429 Mass. at 86; Lucey, 361 Mass. at 574-575. It is not required that all terms of the agreement be precisely specified, and the presence of undefined or unspecified terms will not necessarily preclude the formation of a binding contract. Situation Mgmt. Sys. Inc., 430 Mass. at 878. In such a case, if the parties specify formulae and procedures that, although contingent on future events, provide mechanisms to narrow present uncertainties to rights and obligations, their agreement is binding. Lafayette Place Assocs. v. Boston Redev. Auth., 427 Mass. 509 , 518 (1998). I find, first, that there was no agreement reached to wait to discern the exact boundaries of the Strip until after construction, and to the extent Gaggins testimony is inconsistent with this finding, I do not credit it. Salzberg waived the one-year time condition, but he did not agree to alter the material term of the land to be conveyed to allow AMCD to unilaterally and at its own convenience determine its size and configuration. AMCD was on notice by June 1998 that it did not own all of the land it needed to in order to proceed under the Crowe Plan. Instead of obtaining a legally binding agreement with Salzberg to convey this additional land prior to construction, Gaggin and Fuller merely engaged Salzberg in discussions about potentially changing the land configuration and sent him the Fuller Memo, to which he did not agree. These discussions were merely negotiations to alter a material term of the 1996 Agreement, and AMCD proceeded without obtaining an enforceable agreement. [I]f an essential element is reserved for the future agreement of both parties, the promise can give rise to no legal obligation until such future agreement. Since either party by the very terms of the promise may refuse to agree to anything to which the other party will agree, it is impossible for the law to affix any obligation to such promise. Similarly, in this case, the alleged oral agreement left open a material termthe exact land to be subdivided and conveyedfor future agreement after construction of the addition was completed. This is tantamount to the agreement to reserve agreement on an essential element that was held unenforceable in Lucey. An agreement to reach an agreement is a contradiction in terms and imposes no obligation on the parties thereto. Rosenfield v. United States Trust Co., 290 Mass. 210 , 217 (1935). This is not a case where, though a material term is not precisely defined, the alleged oral agreement included formulae and procedures in place to reduce the uncertainty to clear rights and obligations. Compare Lafayette Place Assocs., 427 Mass. at 518-519 (holding contract providing formula to calculate price of redevelopment land amid future market uncertainties was sufficiently definite). AMCD and 117 Associates originally agreed in the 1996 Agreement that the additional land to be conveyed upon approval of a subdivision plan was the Strip, as depicted in Real Property Agreement Exhibit AA. The Triangular Parcel extends 148.5 feet beyond the Strip into Lot 58 at its southeasterly end. AMCD unilaterally tried to change the size and configuration of the additional land to be conveyed, and Salzberg was not obligated to convey the larger Triangular Parcel. AMCD is, under no circumstances, entitled to conveyance of the 2.23 acre Triangular Parcel shown in the November 1999 Plan. The discussions between AMCD representatives and Salzberg on behalf of 117 Associates to change the configuration of the Strip did not proceed beyond imperfect negotiations. Rosenfield, 290 Mass. at 217. AMCD, though explicitly warned by its surveyors that proceeding with the addition project required some type of formal agreement with Salzberg, nonetheless viewed the unresolved title issues asto quote Fullera matter of semantics and assumed it could defer resolution of the Land Court issues to a later date. This assumption was unfounded. The land to be conveyed in an agreement to convey property is not some semantic detail to be determined at a later date, but is the very heart of the contractthe most material of terms. It cannot be changed by a waiver. Any change must be negotiated, agreed to, and put in writing under the Statute of Frauds. AMCD did not obtain 117 Associates agreement to change the land to be conveyed under the 1996 Agreement beyond the Strip. As to the 1.6-acre Strip, however, AMCD is entitled to the conveyance of the Strip as originally delineated in the 1996 Agreement. This is because of Salzbergs waiver of the one-year time limit to prepare and obtain the necessary subdivision plan and because the time to perform was interrupted by the filing of the complaint. Judgment will enter giving AMCD six months to complete the approval of the necessary subdivision plan, consistent with the Strip as outlined on the 2013 Ducharme Plan, see Ex. 75 and Exhibit D attached hereto, and ordering 117 Associates to cooperate in providing the necessary documentation to complete the approval of the necessary subdivision plan by the Land Court. Every contract in Massachusetts is subject to the implied covenant of good faith and fair dealing, which provides that neither party shall do anything that will have the effect of destroying or injuring the right of the other party to receive the fruits of the contract. Anthonys Pier Four, Inc. v. HBC Assocs., 411 Mass. 451 , 471-472 (1991) (citations omitted); Owen, 56 Mass. App. Ct. at 471. A breach occurs when one party violates the reasonable expectations of the other. Weiler v. PortfolioScope, Inc., 469 Mass. 75 , 82 (2014), quoting Chokel v. Genzyme Corp., 449 Mass. 272 , 276 (2007). A court looks to the partys manner of performance when determining if there has been a violation. T.W. Nickerson, Inc. v. Fleet Natl Bank, 456 Mass. 562 , 570 (2010), citing Ayash v. Dana-Farber Cancer Inst., 443 Mass. 367 , 385 (2005). The plaintiff has the burden to demonstrate a lack of good faith, which can be shown from totality of the circumstances; it is not required to show bad faith. Id. AMCD alleges that 117 Associates breached the implied covenant of good faith and fair dealing because it never intended to honor the terms of the Real Property Agreement and 1996 Agreement when it entered into them. There is no evidence on the record that 117 Associates harbored some secret motive when it entered into the contracts. Moreover, the implied covenant pertains to bad faith in the performance of a contract, not in its execution. Sheehy v. Lipton Indus., Inc., 24 Mass. App. Ct. 188 , 194 n.6 (1987). AMCD also maintains 117 Associates wrongfully refused to convey what it calls the Additional Acreage to induce AMCD to purchase Parcel 2 at an inflated price. With respect to the Strip, 117 Associates waived the time limit for obtaining the subdivision plan within one year and AMCD is entitled to conveyance of that land after preparation and approval of the subdivision plan. However, in 1999 AMCD asserted that it was entitled to conveyance of approximately 2.2 acres, not the 1.6-acre Strip originally agreed to in the 1996 Agreement. A party cannot invoke the implied covenant of good faith and fair dealing to create rights and duties not otherwise provided for in the existing contractual relationship, as the purpose of the covenant is to guarantee that the parties remain faithful to the intended and agreed expectations of the parties in their performance. Uno Restaurants, Inc. v. Boston Kenmore Realty Corp., 441 Mass. 376 , 385 (2004); Ayash, 443 Mass. at 385. 117 Associates was not obligated to convey more land than it agreed to in the 1996 Agreement (the 1.6-acre Strip) and there was no breach of the covenant of good faith and fair dealing in its failure to do so. AMCDs allegation that 117 Associates refused to convey the Strip to gain leverage in the sale of Parcel 2 is conclusory and not supported on the record. Count II is dismissed with prejudice. A fiduciary duty exists when one reposes faith, confidence, and trust in anothers judgment and advice. Doe v. Harbor Schools, Inc., 446 Mass. 245 , 252 (2006) (citations omitted). To establish a breach of fiduciary duty, there must be a duty owed to the plaintiff by the defendant and injury to the plaintiff proximately caused by the breach. Estate of Moulton v. Puopolo, 467 Mass. 478 (2014). In Massachusetts, officers and directors owe a fiduciary duty to protect the interests of the corporation they serve. Gellar v. Allied-Lyons, PLC, 42 Mass. App. Ct. 120 , 122 (1997). Corporate fiduciaries must be loyal to the corporation and . . . refrain from promoting their own interests in a manner injurious to the corporation. Id. Employees in positions of trust and confidence, including senior executives, are considered fiduciaries and owe a duty of loyalty to their employer in matters related to their employment. See Chelsea Indus., Inc. v. Gaffney, 389 Mass. 1 , 11-12 (1983) (holding trusted executives who were not officers or directors nonetheless violated fiduciary duty of loyalty to corporation); Geller, 42 Mass. App. Ct. at 122. The fiduciary duty of loyalty essentially prohibits self-dealing at the expense of the corporations interest. Geller, 42 Mass. App. Ct. at 122-123. AMCD alleges that, as a director, Salzberg breached his fiduciary duty to AMCD because he knew AMCD was building the extension, encouraged it knowing the time and money involved, and then refused to convey the Strip or Triangular Parcel in order to maximize his own profits in the attempted sale of Parcel 2 in 1999. Salzberg was a director for a short time in 1995, which ended completely by 1996. AMCDs original 1995 expansion plans were scrapped and AMCD did not begin expansion plans again until early 1998, in or around the time Salzbergs consulting relationship with AMCD terminated. Salzberg owed no fiduciary duty to AMCD as director at the time of the additions construction and related events in 1998-2000. There was no breach of a fiduciary duty. AMCD also alleges Salzberg breached his duty of loyalty because, as a senior executive, he had his own company (117 Associates) enter into agreements with AMCD and then wrongfully refused to convey the Strip or Triangular Parcel to gain leverage in selling Parcel 2. At the time of the 1996 Agreement, Salzberg was general manager while AMCD transitioned him out of that role. His dual role, including his association with 117 Associates, was well-known to AMCD personnel, including Gaggin, its president. See Exs. 14, 16, 19. All contracts between AMCD and 117 Associates were executed with representation of counsel and Salzbergs role was known and consented to by all involved. Compare Chelsea Indus. v. Gaffney, 389 Mass. 1 , 6 (1983) (noting trusted executives who breached the duty of loyalty actively attempted to conceal their actions from corporation). There was no breach of the duty of loyalty by Salzberg. Moreover, to the extent Salzberg owed any duty of loyalty to AMCD, that duty did not extend to an obligation to convey more land than the Strip as agreed to in the original 1996 Agreement. Counts III and IV are dismissed with prejudice. To prove intentional misrepresentation, a plaintiff must show: the defendant made a false representation of a material fact with knowledge of its falsity for the purpose of inducing the plaintiff to act thereon, and that the plaintiff relied upon the representation as true and acted upon it to his damage. Barrett Assocs., Inc. v. Aronson, 346 Mass. 150 , 152 (1963); see Greenleaf Arms Realty Trust I, LLC v. New Boston Fund, Inc., 81 Mass. App. Ct. 282 , 289-290 (2012). The representation must be false and be one of fact, not opinion, expectation, estimate, or judgment. Zimmerman v. Kent, 31 Mass. App. Ct. 72 , 78, 79 (1991). To prove falsity, it must be shown that the speaker knew the statement was false; alternatively, the speaker need not know that the statement was false if the truth is reasonably susceptible of actual knowledge, or otherwise expressed, if, though a modicum of diligence, accurate facts are available to the speaker. Zimmerman, 31 Mass. App. Ct. at 77; see Barrett Assocs., 346 Mass. at 152. AMCD maintains that 117 Associates and Salzberg expressly represented to AMCD that it owned the Additional Acreage and would convey it once the building was completed in order to later trick AMCD into paying more money for Parcel 2 or the Additional Acreage. AMCD cannot point to any specific representations of the sort by 117 Associates or Salzberg, nor anything that could be deemed false. Zimmerman, 31 Mass. App. Ct. at 78 (The first requirement to sustain a claim of misrepresentation is that the representation made must be false.). Rather, AMCD generally tries to produce a misrepresentation based on such things as Salzbergs attendance at meetings, his alleged encouragement and active participation in the expansions planning, and his knowledge in 1994 that AMCD wanted to expand. Salzberg attended two meetings in early 1995 at which the proposed new building was discussed and he expressed concern with AMCDs plans to connect the two buildings and suggested an addition instead. This was long before AMCD even bought any of Parcel 1, and additionally, involved a plan which was eventually scrapped. AMCD did not begin construction planning again until early 1998, in or around the time Salzberg was ending his consulting relationship. He lived in Hyannis by this point and did not participate at all in these 1998 meetings. To the extent that AMCD relies on Salzbergs suggestion 3.5 years before construction even began as showing that he encouraged and actively participated in planning the expansion, that is not a misrepresentation that could reasonably be relied upon. Additionally, Salzbergs knowledge that AMCD was considering expanding in 1994 when 117 Associates executed the Lease and Real Property is not a specific representation that could form the basis of a misrepresentation claim. To the extent AMCD relies on discussions and negotiations between Salzberg and Fuller in or around June 1998, that also is insufficient to be a false misrepresentation. At most, Salzbergs conduct in that period impliedly waived the time limit for obtaining a subdivision plan. Salzberg, neither individually nor as representative of 117 Associates, made any representation during that time period that AMCD owned the Strip or Triangular Parcel and that he would convey it once construction was done. Salzberg, at most, waived the time limit for obtaining a subdivision plan beyond one year. There is no evidence that 117 Associates or Salzberg specifically represented to AMCD that it owned the Strip prior to construction of the addition. In fact, AMCD was well aware that it was not the record ownerits surveyors raised this issue in May-June 1998 and AMCD acknowledged as much in its Fuller Memo in June 1998. AMCDs contention that Salzberg extended the time limit so that he could trick AMCD later on is conclusory and not supported by the evidence. Count V against 117 Associates and Salzberg is dismissed with prejudice. In the alternative to the breach of contract claim, AMCD alleges promissory estoppel, maintaining that Salzberg and 117 Associates induced AMCD to spend time and money on the expansion by explicitly and implicitly promising to convey the Additional Acreage beyond the Strip when construction was completed. "Promissory estoppel" is an expression not used in Massachusetts, "since it tends to confusion rather than clarity." Loranger Constr. Corp. v. E.F. Hauserman Co., 376 Mass. 757 , 761 (1978). The doctrine to which the term refers is that an offer or promise which the promisor should reasonably expect to induce action or forbearance, and results in the other party reasonably acting or forbearing in reliance upon the promise, will be enforced as a contract. Rhode Island Hosp. Trust Nat'l Bank v. Varadian, 419 Mass. 841 , 849-850 (1995); Loranger Constr. Corp., 376 Mass. at 760-761. The reliance substitutes for consideration, Loranger Constr. Corp., 376 Mass. at 761, so that "an action based on reliance is equivalent to a contract action, and the party bringing such an action must prove all the necessary elements of a contract other than consideration. Rhode Island Hosp. Trust Nat'l Bank, 419 Mass. at 850. As to the 1.6-acre Strip, estoppel is not applicable because there was a contract between AMCD and 117 Associates, and the one-year requirement for obtaining a subdivision plan was waived. AMCD is entitled to the conveyance of the Strip upon approval of a proper subdivision plan. As to the 2.23-acre Triangular Parcel, for which no contract was formed between the parties, the estoppel argument fails. First, there was no specific promise or statement by Salzberg or 117 Associates to convey more than the 1.6- acre Strip. Second, any reliance by AMCD on general discussions or communications with Salzberg as to changing the configuration was unreasonable. A party seeking to invoke the doctrine must demonstrate there was reasonable reliance. Loranger Constr. Corp., 376 Mass. at 760 (1978); Hall v. Horizon House Microwave, Inc., 24 Mass. App. Ct. 84 , 93 (1987). The written contracts between the parties showed the Strip as the land to be conveyed. AMCD was on notice that it lacked the ownership rights necessary to proceed with construction and needed land beyond the Strip to comport with the Crowe Plan. Salzberg never agreed to Fullers proposal in the Fuller Memo, nor did the parties reach an agreement to change the configuration of the land. Any reliance by AMCD on these discussions or exchanges to support a belief 117 Associates or Salzberg would change the amount of land to be conveyed after construction was unreasonable, particularly given this is registered land and there was nothing in written evincing any such promise. The promissory estoppel claim fails as against both Salzberg and 117 Associates, and Count VI is dismissed with prejudice. AMCDs Count VII for injunctive relief pleads a remedy, not a substantive cause of action. See Unitrode Corp. v. Linear Tech Corp., 11 Mass. L. Rptr. 185 (2000) (noting count for injunctive relief against all defendants states a claim for a remedy, not a cause of action.). Count VII is dismissed without prejudice. General Laws c. 93A, § 2(a) declares unlawful any unfair methods of competition and unfair or deceptive acts and practices in the conduct of any trade or commerce. [Note 31] This prohibition is extended to those engaged in trade or commerce in business transactions with others similarly engaged by G.L. c. 93A, § 11. Anthonys Pier Four, Inc., 411 Mass. at 474 (internal citations omitted). To bring a Section 11 action, the acts complained of must have occurred primarily and substantially in Massachusetts. G.L. c. 93A, § 11. Unfair or deceptive conduct is not defined in G.L. c. 93A, Kattar v. Demoulas, 433 Mass. 1 , 13 (2000), given there is no limit to human inventiveness in this field. Levings v. Forbes & Wallace, Inc., 8 Mass. App. Ct. 498 , 503 (1979), quoting H.R. Conf. Rep. No. 1142, 63d Cong., 2d Sess. (1914). Rather, the terms are open ended, Nei v. Burley, 388 Mass. 307 , 313 (1983), and are not limited by traditional tort and contract requirements. Commonwealth v. De Cotis, 366 Mass. 234 , 244 n.8 (1974). When determining unfairness under G.L. c. 93A, a court looks to the nature of the challenged conduct and on the purpose and effect of that conduct. . . . Massachusetts Employers Ins. Exch. v. Propac-Mass, Inc., 420 Mass. 39 , 42-43 (1995). Conduct under c. 93A may be deemed unfair if it is: (1) within the penumbra of a common law, statutory, or other established standard of unfairness; (2) immoral, unethical, oppressive or unscrupulous; or (3) causes substantial injury to competitors or other business people. Milliken & Co. v. Duro Textiles, LLC, 451 Mass. 547 , 562-563 (2008). Unfairness is decided on the specific circumstances of each case. Renovators Supply Inc. v. Sovereign Bank, 72 Mass. App. Ct. 419 , 329 (2008). Although whether a particular set of acts, in their factual setting, is unfair or deceptive is a question of fact . . . the boundaries of what may qualify for consideration as a c. 93A violation is a question of law. Milliken, 451 Mass. at 563 (citations omitted). Unfair or deceptive acts under G.L. c. 93A, § 11 will be judged by a stricter standard than in a consumer c. 93A claim under Section 9. Giuffrida v. High Country Investor, Inc., 73 Mass. App. Ct. 225 , 238 (2008) ([B]usinesses seeking relief under Section 11 are held to a stricter standard than consumers in terms of what constitutes unfair or deceptive conduct.). Not every unlawful act is a violation of G.L. c. 93A; a breach of contract alone, for example, is insufficient for a c. 93A violation. Massachusetts Employers Ins. Exch., 420 Mass. at 43. Nevertheless, conduct undertaken as leverage to destroy the rights of another party or conduct in disregard of known contractual arrangements to secure benefits for a breaching party gives rise to liability under c. 93A. Id. ; Anthonys Pier Four, Inc., 411 Mass. at 474. Finally, the statute ties liability for multiple damages to the degree of the defendants culpability by creating two classes of defendants. Those defendants who have committed relatively innocent violations of the statute are not liable for multiple damages, while a second class of defendants who have committed willful or knowing violations are. Datacomm Interface, Inc. v. Computerworld, Inc., 396 Mass. 760 , 779 (1986) (internal citations omitted). Neither 117 Associates nor Salzberg engaged in conduct which violates G.L. c. 93A, §§ 2 and 11. AMCD argues that they violated the statute based on the alleged breaches of the implied covenant of good faith and fair dealing, Salzbergs and 117 Associates intentional misrepresentations in their dealings with AMCD, and their actions in stringing along AMCD, including inducing detrimental reliance, to force a sale of Parcel 2. For the reasons already discussed above, there was no breach of the implied covenant of good faith and fair dealing by 117 Associates, no misrepresentation by either, nor any reasonable reliance such that a claim for detrimental reliance would lie. While a c. 93A claim may be based on notions of unfairness independent of any tort or contract claim, AMCD points to no other such conduct which could sustain a G.L. c. 93A violation on its own. See, e.g., Fernandes v. Rodrigue, 38 Mass. App. Ct. 926 , 928 (1995) (As to the 93A claim, we think it is absorbed in and vanishes with the [failed] misrepresentation claim.); Rosario v. M.D. Knowlton Co., 54 Mass. App. Ct. 796 , 803 (2002) (dismissing G.L. c. 93A claim because it was premised on other claims dismissed on summary judgment). To succeed on an abuse of process claim, a plaintiff must demonstrate that the process was used to accomplish some ulterior purpose for which it was not designed or intended, or which was not the legitimate purpose of the particular process employed. Millennium Equity Holdings, LLC v. Mahowitz, 456 Mass. 627 , 636 (2010) (citations omitted). Process refers to the papers issued by a court to bring a party or property within its jurisdiction. Jones v. Brockton Public Markets, Inc., 369 Mass. 387 , 390 (1975). An abuse of process claim has three elements: (1) the process was used; (2) for an ulterior or illegitimate purpose; (3) resulting in damage. Gutierrez v. Massachusetts Bay Transp. Auth., 437 Mass. 396 , 407 (2002), quoting Datacomm Interface, Inc., 396 Mass. at 775-776. The tort of abuse of process has been described as a form of coercion to obtain a collateral advantage, not properly involved in the proceeding itself, such as the surrender of property or the payment of money. Vittands v. Sudduth, 49 Mass. App. Ct. 401 , 406 (2000) (internal citations omitted). Bringing a lawsuit with the motive of harassment, vexation, or annoyance is not enough to show an ulterior purpose; rather, one must use the process to gain the collateral advantage indirectly. Psy-Ed Corp. v. Klein, 459 Mass. 697 , 713-714 (2011). AMCD alleges that 117 Associates filed suit in bad faith for an ulterior purpose, that of forcing AMCD to purchase Parcel 2 at an inflated price. There is no evidence of an ulterior purpose. Once it became apparent in 1999-2000 that the parties disputed title to portions of registered Lot 58 and the status of the building thereon, a lawsuit was an appropriate means of resolution. The full scope of the parties confusion about the size and configuration of the land to be conveyed came to light only after AMCD declined to purchase Parcel 2. Count IX is dismissed with prejudice. Having established the parameters of the contract between AMCD and 117 Associates and determined AMCDs counterclaim, I now turn to the claims 117 Associates raised in its complaint. Though styled as a claim for injunctive relief, in substance this claim is one for continuing trespass on the Strip and I will treat it as such. A trespass is an invasion of the interest in the exclusive possession of land, as by entry upon it. Amaral v. Cuppels, 64 Mass. App. Ct. 85 , 90-91 (2005), quoting Restatement (Second) of Torts § 821D comment d (1979); Monterosso v. Gaudette, 8 Mass. App. Ct. 93 , 99-100 (1979). To prevail on a trespass claim, 117 Associates must prove that (a) it has actual and lawful possession of the property, and (b) AMCDs entry was intentional and illegal. Gillespie v. Aliot, 14 LCR 429 , 430 (2006); see New England Box Co. v. C&R Constr. Co., 313 Mass. 696 , 707 (1943). A trespass may occur continuously . . . [and] when a trespass is caused by the erection of a permanent structure, that trespass commences on a date certain, and the trespass continues as long as the offending structure remains. Porter v. Clarendon Natl Ins. Co., 76 Mass. App. Ct. 655 , 659 (2010) (internal citations omitted). 117 Associates avers AMCDs building and related structures are ongoing trespasses on the registered Strip, of which 117 Associates is record owner. It argues AMCD has no right to possession because it failed to subdivide the land within one year and therefore lost any contractual right to conveyance of that property under the 1996 Agreement. Given, however, that I have found that 117 Associates waived the time limit, AMCD has an enforceable contract for the conveyance of the Strip upon approval of an appropriate subdivision plan. Moreover, though the Lease for Parcel 1 (which included the Strip) expired in October 1997, the 1996 Agreement contained a specific provision which grants AMCD the right to enter upon the [Strip] and to use the [Strip] as if the [Strip] were conveyed this date to [AMCD] by [117 Associates]. Ex. 22, ¶ 3. As such, I find that 117 Associates cannot demonstrate that AMCD entered the Strip illegally without privilege to do so. Count I of 117 Associates complaint is dismissed with prejudice. In Count II, 117 Associates brought a claim for trespass as to Parcel 2 (the balance of registered Lot 58 less the Strip), alleging that AMCD wrongfully continued to use Parcel 2 for antenna testing after the Lease expired on October 31, 1999. The trespass standard set forth above in Section B.I is incorporated herein. 117 Associates is the record owner of Lot 58, which includes Parcel 2. Unlike the Strip, AMCD has no right to possession or privilege to enter any portion of Lot 58 beyond the Strip. The evidence establishes that AMCD used Parcel 2 for antenna testing at the time the Lease expired on October 31, 1999, and that, as of at least March 5, 2001, the antenna was still present on Parcel 2. This is demonstrated by: (i) photographs from early 2000 show the portable antenna on Parcel 2; (ii) Salzberg visited the area in June 2000 and observed the antenna equipment; (iii) the antenna was still on Parcel 2 as of October 2000 and 117 Associates notified AMCD of the holdover provisions in November 2000 and sought use and occupancy payments; and (iv) again, in March 2001, 117 Associates notified AMCD that the antenna equipment was still present on the property and sought further use and occupancy payments. Exs. 63, 67, 69, 84; Tr. 1:132-133, 2:16-17. Thus, AMCD trespassed on Parcel 2 from November 1999 through March 2001, and was a holdover tenant on Parcel 2. AMCDs use and occupancy of Parcel 2 ended at the end of March 2001. The question now is what damages should be assessed for AMCDs trespass. 117 Associates seeks and is entitled to damages from AMCD in the form of use and occupancy payments as a tenant at sufferance and Additional Rent under the Lease. A tenant who, though originally in lawful possession of property pursuant to a lease, holds over after its expiration without any express or implied agreement is deemed a tenant at sufferance. Ames v. Beal, 284 Mass. 56 , 59 (1933); Benton v. Williams, 202 Mass. 189 , 192 (1909); Staples v. Collins, 321 Mass. 449 , 451 (1947). A tenant at sufferance does not stand in privity with the landlord. Margosian v. Markarian, 288 Mass. 197 , 199 (1934). Under G.L. c. 186, § 3, tenants at sufferance in possession of land or tenements shall be liable to pay rent therefor for such time as they may occupy or detain the same. In the absence of a lease provision requiring payments beyond the lease term, the correct measures of damages for use and occupancy is the current fair rental value of the premises. Kobayashi v. Orion Ventures, Inc., 42 Mass. App. Ct. 492 , 502 (1997); see Lowell Hous. Auth. v. Save-Mor Furniture Stores, Inc., 346 Mass. 426 , 431 (1963). The Lease includes a holdover provision for payment by a tenant who remains in possession of the premises (Parcels 1 and 2), including any part thereof, after expiration of the Lease. As such, use and occupancy is measured by this provision rather than the fair market rental value. Kobayashi, 42 Mass. App. Ct. at 502. Paragraph 14 provides that a tenant at sufferance is liable for basic monthly rent at two times the highest monthly rent during lease term, plus Additional Rent. Ex. 2, ¶ 14. The highest rent for Parcel 2 during the lease term was $2,083.00. Id. at ¶ 3(b). Additional Rent includes all costs, expenses, and obligations relating to Parcels 1 and 2. Id. at ¶ 4. Additional Rent does not, however, include real estate taxes on Parcel 2. Id. at ¶ 4(b). Consequently, AMCD is liable for double rent ($4,166.00) on Parcel 2 from November 1999 through March 2001, a total of 17 months for an amount of $70,822.00, but is not liable for the real estate tax payments for Parcel 2 for that period. The parties negotiated the holdover provision with counsel and AMCD, therefore, is liable under it. See Kobayashi, 42 Mass. App. Ct. at 501 (The lease in this case was the product of tough negotiation by experienced parties and their counsel. Particularly in such circumstances, courts should not undertake to be wiser than the parties.) (internal quotations omitted). However, there is insufficient evidence in the record demonstrating that AMCD continued to be a holdover tenant beyond March 2001. To the extent 117 Associates seeks use and occupancy payments in the form of double rent and additional rent for a period of nearly 14 years, it is not entitled to such payments. 117 Associates also seeks attorneys fees for the costs of collection incurred by 117 Associates for AMCDs continuing unlawful occupancy of Parcel 2. Under the terms of the Lease, 117 Associates is only entitled to reasonable attorneys fees in connection with legal fees incurred in reletting the property upon AMCDs default. Ex. 2, ¶ 16(b)(iii). 117 Associates is not entitled to attorneys fees incurred in recovering use and occupancy fees for a tenant at sufferance. Judgment will enter in favor of 117 Associates and against AMCD on Count II for damages in the amount of $70,822.00. I have found that AMCD cut trees on the Strip and on Parcel 2, land owned by 117 Associates. The questions are (a) whether AMCD did so without license, (b) if so, whether AMCD had good reason to believe it was authorized to do so, and (c) if so, what are the damages. AMCD argues that because 117 Associates cannot prove that AMCD wrongfully removed trees on the Strip, it is not liable for damages with respect to trees removed on the Strip. Paragraph 5(c) of the 1994 Lease prohibited alterations or improvements to Parcels 1 and 2 without 117 Associates prior, written permission. Ex. 2, ¶ 5(c). That Lease provision notwithstanding, paragraph 3 of the 1996 Agreement expressly granted AMCD the right to use the Strip as if it were conveyed this date to [AMCD] by [117 Associates]. Ex. 2, ¶ 3. The 1996 Agreement supersedes the Lease specifically as it relates to use of the Strip. Though AMCD does not own the Strip because it has yet to obtain an approved subdivision plan, it had the right under the 1996 Agreement to use the Strip as if it owned it. A trespass to trees claim therefore does not lie as to the trees cut within the Strip. (i) [AMCD] must give [117 Associates] written notice prior to any commencement of any such activity [tree removal and antenna construction] together with a detailed description of the work to be performed and (ii) [117 Associates] shall have approved of such work, provided such approval shall not be unreasonably withheld or delayed. Notwithstanding this requirement, AMCD cut down the trees on Parcel 2 without first obtaining 117 Associates permission. In June 1999, AMCD requested a 5-year lease extension on Parcel 2 and also permission to cut trees and construct an antenna tower there. Ex. 41. 117 Associates opted not to renew the Lease in July 1999 and also requested AMCD refrain from making further alterations on the property. Ex. 43. Withholding permission for a large-scale tree clearing was not unreasonable, given that AMCDs request came during the last few months of the Lease, the Lease was not going to be renewed, and any large alteration to the property could affect its value. Moreover, even if Salzberg knew that AMCD planned on cutting trees, the Leases language was explicit in that AMCD had the right to cut trees only on two conditions. They did not meet those prerequisites. I therefore determine that AMCD did not have good reason to believe it owned Parcel 2 or was otherwise lawfully authorized to cut trees thereon. G.L. c. 242, § 7. Moreover, AMCD cut the trees in the spring of 1999 prior to even seeking 117 Associates permission to do so. [Note 32] I find that AMCD willfully cut trees on Parcel 2. Consequently, the damages for trespass to trees on Parcel 2, discussed below, must be trebled. Glavin v. Eckman, 71 Mass. App. Ct. 313 , 317 n.8 (2008) ([A]bsent proof that the defendants had good reason to believe that they were otherwise lawfully authorized to cut the trees by virtue of permission . . . the statute requires the damages owing to the wrongful cutting to be trebled.). The statute does not specify how damages are to be measured. Larabee v. Potvin Lumber Co., 390 Mass. 636 , 643 (1983); Glavin, 71 Mass. App. Ct. at 317-318. One measure of damages used is the value of the timber which has been wrongfully cut, while another is the diminution in value of the property attributable to the cutting. Id. However, where the value of the timber cut is negligible, or the diminution in value of the property owing to the cutting is minimal or nonexistent, a different measure of damages may be needed to compensate the plaintiff and to deter the wrongful cutting. Ritter v. Bergmann, 72 Mass. App. Ct. 296 , 305 (2008), citing Glavin, 71 Mass. App. Ct. at 317-318. Replacement or restoration costs are permissible as a measure of damages where diminution in market value is unavailable or unsatisfactory as a measure of damages. Glavin, 71 Mass. App. Ct. at 318, citing Trinity Church v. John Hancock Mut. Life Ins. Co., 399 Mass. 43 , 49 (1987); Ritter, 72 Mass. App. Ct. at 307. 117 Associates argues that restoration costs, specifically calculated using the cost of cure method, is the appropriate method of damages in this instance, rather than the value of timber wrongfully cut or the diminution in property value. 117 Associates seeks $1,297,890.20 for tree loss plus restoration costs, which after trebling amounts to $3,893,670.60 in total alleged tree damages. While I agree that restoration or replacement costs are the appropriate method of calculating damages here, I do not agree that those costs reasonably rise to the amount that 117 Associates seeks. A judge, as gatekeeper, has broad discretion to determine whether evidence other than fair market value is relevant to the question of damages. Glavin, 71 Mass. App. Ct. at 318-319 (holding judge did not abuse his discretion in finding fair market value was not adequate measure of damages suffered upon wrongful tree cutting where plaintiff sought to use ten mature oak trees as part of a wetlands restoration project); see Ritter, 72 Mass. App. Ct. at 306-307 (holding restoration costs were appropriate measure of damages where plaintiffs sought to sell lot and were concerned about lack of privacy after wrongful cutting). Here, the defendants willfully cut down a large, heavily-wooded forest that cannot be replaced. Finding of Fact, ¶ 96. Although Parcel 2 cannot be developed into the large-scale commercial complex 117 Associates originally envisioned, I find that it is still developable on a smaller scale. See Findings of Fact, ¶¶ 76-81. 117 Associates concerns over the loss of the natural privacy screening between the AMCD and 117 Associates properties due to the wrongful cutting remain real, even with a smaller-scale development. Moreover, taking into consideration the extensive efforts needed to restore the land to its pre-cutting stateincluding cleaning the site of the hundreds of tree stumps left by AMCD and implementing erosion control methodsI find that a restoration cost measure of damages is necessary to adequately compensate 117 Associates and as a measure of deterrence for wrongful tree cutting. Cost of cure is a recognized method of calculating restoration damages. Glavin, 71 Mass. App. Ct. at 320-321 (noting with approval experts use of cost-of-cure method as a means to assess restoration costs). Cathcart, 117 Associates expert, applied this method to reach his opinion that the cost of restoration was $1,297,890.20. However, when applying a restoration cost measure of damages, a test of reasonableness is imposed. Not only must the cost of replacement or reconstruction be reasonable, the replacement or reconstruction itself must be reasonably necessary in light of the damage inflicted by a particular defendant. Id. at 319; Ritter, 72 Mass. App. Ct. at 307. In Glavin, the estimated total replacement costs for ten mature oak trees, using the cost of cure method, was $56,369 plus an additional $57,300 to install them, because of the wetland topography. Glavin, 71 Mass. App. Ct. at 321-322. The court found that the jury did not err in finding $30,000 to be the reasonable cost of restoring the property as nearly as possible to its original condition where direct restoration of the affected area was either physically impossible or so disproportionately expensive that it would not be reasonable to undertake such a remedy. Id. at 320. This amount is appropriate given the Plant Guides directive that tree value appraisals must be reasonable, especially as compared to property values. The original restoration costs sought by 117 Associates, before trebling, were $1,297,890.20. Parcel 2s total property value in 1998approximately one year before the tree cuttingwas $285,000. The $1,297,890.20 damages figure is grossly disproportionate to the property value, in direct contravention of the Plant Guides directive on reasonableness. I find the $101,833.97 damages figure to be reasonable in light of the property value of $285,000. Judgment will enter in favor of 117 Associates and against AMCD on Count III for damages in the amount of $101,833.97, which after trebling totals $305,501.91. 117 Associates alleges that the totality of AMCDs conduct from 1998-2000 was unfair and deceptive, violating G.L. c. 93A, §§ 2 and 11, and causing 117 Associates to lose property rights and contractual benefits and incur significant loss and damage. According to 117 Associates, AMCDs alleged unfair and deceptive acts include building on registered land of another knowing that it did not own it, making misrepresentations to the Town of Bolton Board of Selectman and building inspector, taking the position that it owned the 2.23-acre Triangular Parcel, cutting trees on Parcels 1 and 2, and engaging in long, dilatory negotiation with 117 Associates over purchasing Parcel 2. Applying the standards under G.L. c. 93A, §§ 2 and 11, that I discussed in Section B.III and incorporate here, I find that at all relevant times, both AMCD and 117 Associates were engaged in trade or commerce and the acts at issue occurred primarily and substantially in Massachusetts. As discussed in more detail below, I find that AMCDs actions in negotiating and agreeing to purchase Parcel 2 without intending to actually go through with the agreed transaction were willful and knowing and constitute unfair and deceptive acts in trade or commerce that caused 117 Associates damage, in violation of §§ 2 and 11. AMCD was aware prior to the expiration of the Lease on Parcel 2 that 117 Associates wished to sell its property. On August 4, 1999, after its request for a Lease extension was denied, AMCD, through Gaggin, offered to buy Parcel 2, minus the Triangular Parcel, for $375,000 subject to the approval of the Cobham Board. Ex. 45; Tr. 4:27-28. Salzberg counteroffered on August 19, 1999 at a price of $525,000, and specifically requested a legally binding agreement from AMCD by September 17, 1999, after which time it is our goal to sign up a realtor. Ex. 47. On September 10, 1999, Salzberg did in fact begin the preliminary steps of reaching out to a realtor regarding the Parcel 2 property. Ex. 49. Gaggin counteroffered for $475,000 on September 15, 1999, telling Salzberg that [i]f we can agree, I can move quickly at bringing this issue before the Cobham Board. Ex. 48. Salzberg and Dalton conditionally accepted the offer on September 22, 1999, requesting a good faith deposit of 4% of the total sum and final action between October 9 and November 1, 1999. In the acceptance letter, Salzberg specifically noted to Gaggin that he did not want to wait for an established meeting of the board to get an answer on this issue. Ex. 50. Though Gaggin made an offer to purchase 117 Associates property as early as August 4, 1999, he testified that his whole purpose of negotiating with Salzberg was to complete a business analysis for the Cobham Board. He acknowledged that he didnt think it would accept the $475,000 number and did not present it, nor advocate for that number to the Cobham Board. Gaggin, in fact, specifically testified: I knew the Board wouldnt accept it [$475,000] but I told them Hey here it is. They wanted a number; they wanted an analysis, and I gave it to them. Tr. 4:32. Moreover, Gaggin acknowledged that he could have figured out a number acceptable to the Cobham Board prior to engaging Salzberg in negotiations, but chose not to. Tr. 4:31. After his first offer to 117 Associates in August 1999, Gaggin did not inform 117 Associates until December 7, 1999, that AMCD did not want to purchase Parcel 2. This left 117 Associates in limbo for several months and stymied their efforts to engage a realtor, notwithstanding that Salzberg specifically informed Gaggin that they intended to engage a realtor if AMCD did not agree by September 17. AMCD, through Gaggin, acted in the utmost bad faith toward 117 Associates. It engaged in a lengthy negotiation and accepted 117s offer to sell Parcel 2 with no intention whatsoever of actually going through with the purchase. The only reason AMCD agreed to buy Parcel 2 was to find out what price 117 Associates would sell it for. In other words, without telling 117 Associates, AMCD reversed the usual course of negotiations: instead of getting a price and deciding whether to buy at that price or not, it first agreed to buy and then decided whether the price was right. AMCD deliberately concealed its intention not to honor its agreement to buy Parcel 2 from the very beginning of negotiations. This is an unfair and deceptive act in trade or commerce in violation of G.L. c. 93A, §§ 2 and 11. See Rex Lumber Co. v. Acton Block Co., 29 Mass. App. Ct. 510 , 518-520 (1990) (deliberately concealing intention not to execute extension or honor oral extension agreement affirmed as violation of c. 93A). AMCDs unfair and deceptive acts caused 117 Associates damage. AMCD agreed to buy Parcel 2 for $475,000 (it already had the right to obtain the Strip for no further consideration). The market value of Parcel 2 in 1998 was $210,000. Thus, AMCD agreed to pay a premium over the market value, probably because Parcel 2 was more useful and valuable to AMCD as an extension of the land it already owned than it would be to a third-party buyer. While 117 Associates retained Parcel 2 after AMCD reneged on its agreement and could have sold Parcel 2 to a third-party buyer, it could only reasonably have expected to sell it for its market price of $210,000, not the $475,000 to which AMCD agreed. Therefore, the damage that AMCDs unfair and deceptive act caused 117 Associates is the loss of the premium to which AMCD agreed: that is, the difference between the $475,000 sales price and the $210,000 market value, or $265,000. I further find that AMCDs unfair and deceptive acts were willful and knowing. 117 Associates is entitled to double damages. Judgment will enter in favor of 117 Associates and against AMCD on Count IV for damages in the amount of $265,000.00, which after doubling totals $530,000.00. 117 Associates is entitled to recover its attorneys fees in connection with its c. 93A claim. G.L. c. 93A, § 11. 117 Associates shall submit its application for attorneys fees, with accompanying affidavits, no later than 30 days after the date of this Decision. AMCD shall file its response within 14 days thereafter. In both 117 Associates application and AMCDs response, the parties shall address the degree to which the award of attorneys fees can or should be limited only to those fees incurred in prosecuting the c. 93A claim on which 117 Associates prevailed. 117 Associates did not present any evidence in support of its claim for nuisance, or seek any remedy in its post-trial brief. It has, in effect, waived its claim for nuisance. Count V shall be dismissed with prejudice. Judgment shall enter as follows. On 117 Associates complaint, Counts I and V shall be dismissed with prejudice. On Count II, judgment shall enter in favor of 117 Associates and against AMCD for damages in the amount of $70,822.00. On Count III, judgment shall enter in favor of 117 Associates and against AMCD for damages in the amount of $101,833.97, which shall be trebled to $305,501.91. On Count IV, judgment shall enter in favor of 117 Associates and against AMCD for damages in the amount of $265,000.00, which shall be doubled to $530,000.00, plus 117 Associates reasonable attorneys fees. It should be noted that prejudgment interest on the damages under Counts III and IV shall run on the amount of the original compensatory damages, not on the doubled or trebled amount. City Coal Co. of Springfield, Inc. v. Noonan, 434 Mass. 709 , 715-717 (2001); Makino, U.S.A., Inc. v. Metlife Capital Credit Corp., 25 Mass. App. Ct. 302 , 320-321 (1988). On AMCDs counterclaim and third-party complaint, Counts II, III, IV, V, VII, and VIII shall be dismissed with prejudice, and Count VI shall be dismissed without prejudice. On Count I, judgment shall enter declaring that AMCD is entitled to specific performance of the 1996 Agreement. AMCD shall be entitled to prepare and have approved within six months of the date of judgment a subdivision plan creating the Strip, as shown on Exhibit D attached hereto, as a separate lot from Lot 58; 117 Associates shall be ordered to cooperate fully with AMCD in the preparation and approval of the subdivision plan. Upon approval and registration of the subdivision plan, 117 Associates shall convey the Strip to AMCD. No final judgment shall issue at this time. Final judgment shall issue upon determination and awarding of 117 Associates attorneys fees. [Note 1] Lease Exhibit A-1 says Exhibit A in handwritten letters at the top; Lease Exhibit A-2 says Exhibit B. These documents are referenced on page 1 of the Lease as Exhibits A-1 and A-2, and are likewise identified on pages 17-18 as Exhibits A-1 and A-2. I will refer to them as Lease Exhibits A-1 and A-2 throughout this decision, notwithstanding the Exhibit A and Exhibit B handwritten at the top of each document. [Note 2] Lease Exhibit A-2 also shows as cross-hatched Lot 56. Lot 56 was not included as part of Parcel 1. Compare Lease Exhibits A-1 and A2, attached to Trial Exhibit 2. As noted in Exhibit 33, Lot 56 was part of a 2.2+/- easement area for Bolton Woods Way. See Ex. 33, p.1; Ex. 79, p. 1. [Note 3] There is an attachment to the 1996 Agreement called Inserts to Agreement, which appears to change some of the agreements terms. However, the evidence is that the Inserts to Agreement page was not intended to be part of the 1996 Agreement and has no effect. Richard Shiels, attorney for AMCD, sent 117 Associates a draft agreement on December 27, 1995. Ex. 17. Gary Fentin, attorney for 117 Associates, sent back an Inserts to Agreement page on December 28, 1995. See Ex. 18 (The Inserts to Agreement which you provided yesterday. . . .). Shiels objected to the Inserts to Agreement, as reflected in his letter of December 29, 1995. See Ex. 18. In particular, Paragraph four of the Inserts to Agreement required AMCD to obtain a subdivision plan and Land Court Approval by April 30, 1996. See Ex. 18, p. 2; Ex. 22, p. 10. Fentin wrote Shiels on January 10, 1996, proposing several changes to the substantive agreement itself, including a twelve-month period for subdividing the Additional Acreage and obtaining Land Court Approval. Ex. 20. The parties ultimately agreed on the January 10, 1996 proposed changes. See Ex. 21. AMCD had twelve (12) months from the date of the 1996 Agreement to subdivide the Additional Acreage and obtain Land Court approval, as reflected in the 1996 Agreement. Ex. 22, ¶ 2. (a) Employment as General Manager: The employment period under this Agreement shall commence on the date hereof [November 22, 1994] and shall continue until the earlier of [AMCDs] engagement of another individual as General Manager or the termination of this Agreement pursuant to the provisions of paragraph 5 hereof (the Employment Period). (b) Engagement as a Consultant: The consulting period under this Agreement shall commence immediately upon [AMCDs] employment of another individual as General Manager and shall continue until the termination of this Agreement pursuant to the provision of paragraph 5 hereof (the Consulting Period). Paragraph 5 provided, for the first three years after November 22, 1994, only AMCD could terminate the contract. Thereafter, either AMCD or Salzberg could terminate the contract. Ex. 4, ¶¶ 2, 5. [Note 5] Fuller was hired at AMCD in 1997 to run the financial operations. To the extent Fuller testified that Salzberg was still an officer or director in 1997, I do not credit that testimony, as it is directly contradicted by the 1997 corporate filings which do not list Salzberg as either an officer or director. Ex. 82; Tr. 5:150, 154-157. [Note 6] The Board of Selectmens approval of the Crowe Plan required that AMCDs buildings be on separate lots, each with a 50-foot setback. A relocation of the proposed addition created a 41-foot setback. AMCD entertained the idea of adding land to Lot 59, but faced construction delays as this change to a lot line would also have required approval of the Land Court. Ex. 27, p. 2, ¶ 1; Ex. 31, p. 1 & Sketch Exhibit D; Ex. 33, p. 2; Ex. 37. [Note 7] Area A included Lots 8, 10, and 59. Fuller described Area B as the land purchased as part of the January 1996 purchase but . . . not yet surveyed or recorded in Land Court. Ex. 33, p.1. Area Blisted as 2.09 acresshowed the original Additional Acreage configuration. Given that Lot 57 had already been conveyed at this point, see Exs. 22, 79, Fullers description of Lot 57 as part of the land not yet recorded with the Land Court is erroneous. The only piece of land left to be conveyed in June of 1998 was the Strip. Area C shows the additional 1.6 acres needed for AMCD to have ownership of all the land required under the Crowe Plan. [Note 8] Lot 57, though shown as part of Area B, had already been conveyed and registered in 1996. [Note 9] For instance, the Lease, Real Property Agreement, 1996 Agreement, 1995 Option to Extend the Lease, and the 1998 Lease Extension were all in writing and are part of the trial record. See Exs. 2, 3, 15, 22, 24. [Note 10] The letter included the same diagram attached to the Fuller Memo, showing Areas A, B, and C. The diagram depicted Area B as the Additional Acreage configuration, consisting of both Lot 57 and the Strip. AMCD represented to the Board that it had purchased the entirety of the 2.09 acre Additional Acreage in 1996, but that Area B had not yet been surveyed or recorded in Land Court. Again, this description was erroneous, as Lot 57capable of conveyance in 1996 as a separate lothad already been conveyed to AMCD and registered in Land Court. See Exs. 22, 79. The only area remaining to be carved out and registered was the Strip portion of Area B/the Additional Acreage. [Note 11] The initial lease on Parcel 2 was set to expire on October 31, 1997. Per the Lease, if AMCD purchased Parcel One on or before October 31, 1997, it had the option to extend the lease on Parcel 2 until October 31, 1999, provided such extension was exercised by giving written notice on or before September 30, 1997. On January 9, 1998, AMCD and 117 Associates agreed that AMCD could renew the Lease and treat it as if AMCD had exercised its option within the period originally provided for in the Lease, and extended the Lease on Parcel 2 to October 31, 1999. Exs. 2, 24. [Note 12] As indicated in the February 15, 2000 letter, Salzberg had received a drawing dated April 22, 1999. This was a plot plan completed by AMCDs surveyors approximately a month after the addition was completed. AMCD sent this plan to Salzberg in June of 1999 as part of its request to extend the lease on Parcel 2, as the plan showed AMCDs plans for the location of cleared trees and the tower to be constructed. See Exs. 39, 40, 41, p.2. [Note 13] The November 3, 2000 letter stated that there had been antenna testing equipment present on Parcel 2 as late as the week of October 9, 2000. A second letter in March 2001 stated that As of March 5, 2001, AMCD was still using parts of Parcel 2 for antenna testing. Exs. 67, 69. [Note 14] Examples of standard construction costs include clearing, grading, drainage, utilities, landscaping, lighting, etc. Tr. 4:103. [Note 15] To ascertain the largest possible square footage permitted, Beals multiplied 28.4 (total acreage) by 43,560 (number of square feet in an acre) and then multiplied the resulting number by 0.08% (the maximum lot coverage). The result is 98,968 square feet, or approximately 100,000 square feet. Ex. 77; Tr. 4:98-99. The building could not seek to expand upward beyond two stories to avoid this lot coverage limitation, given that the bylaw imposes a maximum height requirement of no more than 32 feet above grade. [Note 16] The Sales Comparison Approach compares the subject property to similar properties recently sold or listed for sale based on a common denominator unit of comparison, making adjustments to the comparable prices to account for differences from the subject property. Accounting for whether the comparable properties are deemed superior or inferior to the subject property, the appraiser determines of a range of unit prices and reaches an estimated value for the subject property based on that range. [Note 17] Scenario 2s market value came out to $791,444, but was rounded to $790,000 by Cary. [Note 18] The actual market value was $494,840 in Scenario 3, but Cary rounded it to $490,000. Ex. 72, p. 49. [Note 19] Bowlers Scenario 1 appraised AMCDs Lots 8/8A, 10, 57, and 59, plus the 2.23 acre Lot 60, as shown on Ex. 51, as a single 6.86 acre parcel. However, given that I am only concerned with determining the appraised value of 117 Associates property, I need only address Bowlers Scenarios 2 and 3. [Note 20] Build to suit is when a developer would only build on a site if he or she had a specific tenant in place or was going to purchase the site for the developers own business. Tr. 4-235. [Note 21] Salzberg also obtained a Limited Appraisal of 117 Associates 28.4 acre property in July of 2000 from Stephen Foster, MAI, which valued the 28.4 acres between $2,500,000 and $3,000,000. The report is specifically based on the owner receiving approvals to build a two-story, 200,000 square foot building on the site. For the same reasons discussed in Findings of Fact ¶¶ 73, 74-78, I find it is not economically feasible to develop the site for this use. Moreover, this was a limited appraisal. The report specifically states: The results of limited appraisals are less reliable than the conclusions developed in a complete appraisal. I do not credit this report. Ex. 64, p. 3. [Note 22] He appraised Scenario 2 (Lot 58A26.17 acres) at $260,000 in 2013; Scenario 3 (Lot 58A plus Lot 60, i.e. 117 Associates registered Lot 58) was valued at $340,000. [Note 23] Cathcart also visited the property again in 2014 to take pictures of the new stump growth. Ex. 92; Tr. 3:123-124, 132.
condition, and species percentages), resulting in the Future Plant Cost. The Future Plant Cost in this example amounts to $33.63, which accounts for the loss in value on that tree during those six years. Ex. 71, p. 9, 13; Tr. 109-112. [Note 25] Site restoration costs are such things as clearing the land, pickup up the stumps, clearing all the debris, logs and everything else that was in there and planting grass or trees in the area so it can be maintained and basically bring it back to precasualty condition in a reasonable manner. Tr. 3:118. [Note 26] Even if he had been able to do so, Billing testified that he did not believe cost of cure was the appropriate method to apply when dealing with a forested area. Tr. 5:39, 64, 74. [Note 27] 117 Associates maintains the Additional Acreage originally included Lot 57 and the Strip and that once Lot 57 was conveyed, the remaining Additional Acreage was the 1.6-acre Strip. Plaintiff and Third Party Defendants Proposed Findings of Fact, ¶ 23. Thus, when 117 Associates refers to the Additional Acreage in its brief, it is speaking of the 1.6-acre Strip. Plaintiffs Brief, at 6; Plaintiffs Findings of Fact, ¶ 101. AMCD believes that Additional Acreage to be an approximately 2.2 acre piece of Land. Defs Brief, at 1. The parties use the term Additional Acreage in their Agreed Facts. Ex. 1. However, the only attempt at defining what they mean by this term is a reference to Real Property Agreement Exhibit AA, showing the Additional Acreage in 1994 as Lot 57 and the Strip. Ex. 1, ¶ 17. [Note 28] 117 Associates raised Statute of Frauds as an affirmative defense to AMCDs counterclaims and third-party claims. [Note 29] Words such as on the condition that, provided that, and if are often used to create a condition precedent. See Restatement (Second) of Contracts § 226, comment a (1981). [Note 30] To the extent AMCD seeks to rely on conduct occurring before January 1996, it cannot do so. Conduct prior to the creation of the one-year subdivision requirement is not clear, decisive, and unequivocal conduct evincing the intent to relinquish 117 Associates right to insist on a time limit for the conveyance of the Strip. KCAT, Inc. v. Rubin, 62 Mass. App. Ct. 689 , 695 (2004). Salzberg could not impliedly waive, by his conduct, a condition which had not yet been created. For example, as a basis for implied waiver, AMCD relies on the fact that Salzberg and Dalton were aware in 1994 that the purpose of including the Additional Acreage in the Lease and Real Property Agreement was because AMCD wanted to expand in the future. This knowledge is irrelevant to whether Salzberg impliedly waived, after 1996, the condition that any such conveyance occur within a specified time limit. [Note 31] Trade or commerce, as defined in relevant part in the statute, includes: the advertising, the offering for sale, rent or lease, the sale, rent, lease or distribution of any services and any property, tangible or intangible, real, personal or mixed. G.L. c. 93A, § 1(b). [Note 32] AMCD maintains the clear-cut occurred prior to 117 Associates July 1999 letter declining to renew the Lease and withholding permission to make alterations to Parcel 2. 117 Associates maintains any tree- cutting occurred after AMCD sought permission in June 1999. Though I find that it occurred before, whether it occurred before or after June-July 1999 is immaterial. AMCD lacked the required approval in either instance to cut the trees. [Note 33] 117 Associates is not entitled to the tree loss value for the Cleared Lot 60, an amount of $71,703.12, because AMCD had the right to use the Strip as if it owned it and therefore did not wrongfully cut trees on this parcel.